Posted on July 31, 2015 by Sara K.
A lot of people ask me how long I’ve been vegan and why I went vegan, but few ask how I became vegan, and nobody has ever asked where I went vegan. Even before I became a semi-vegetarian, I was never a big eater of land flesh. Okay, there was a small set of foods made from animal flesh which I really liked, but they were occasional treats, not a dietary staple. I think my mother had a lot of influence here – in her youth, she ate little meat, not because of principles, but because her family could not afford to buy too much meat (she grew up in a part of the world which, at the time, did not subsidize the exploitation of non-human animals as heavily as the United States does today, and thus the cost of animal-based vs. plant-based foods more accurately reflected their true costs). Thus, my mother did not grow up with the notion that meat was an essential part of a meal. And neither did I. To this day, I still do fully understand why some people are baffled by the notion a single filling, wholesome, satisfying meal without meat. I am baffled when I see a menu for a restaurant which isn’t a steakhouse/seafood specialist/etc., has 15+ dishes … and yet still does not have a single dish which is vegetarian, let alone vegan. Can’t people have more imagination, especially since most people in the past 5,000 years have had mostly plant-based diets? Because of all of the above, it wasn’t a big deal for me to become a semi-vegetarian during my first year of high school – I stopped eating land animal flesh, but continued to eat sea animals, dairy, and eggs. But even my consumption of sea animals became more limited. While I was in middle school, my family went to visit the Monterey Bay Aquarium, and I learned about their seafood watch program. The exhibit described how the sea animals we choose to consume affects the ocean ecology, and made a case for choosing to avoid supporting the worst practices. It made a deep impression on me, though I think the lesson I derived from it over the years is not exactly the one they intended – after all, they advocate consuming the ‘good’ seafood, not abstaining from consuming sea animals altogether. Even during my middle school years, just about the only time I can remember eating land animal flesh was when we visited my mother’s friends for dinner, and they served beef. I think there is an irony that the very same kitchen where that beef was cooked – the only beef I still remember ever eating – is the very same kitchen where I transitioned to veganism. 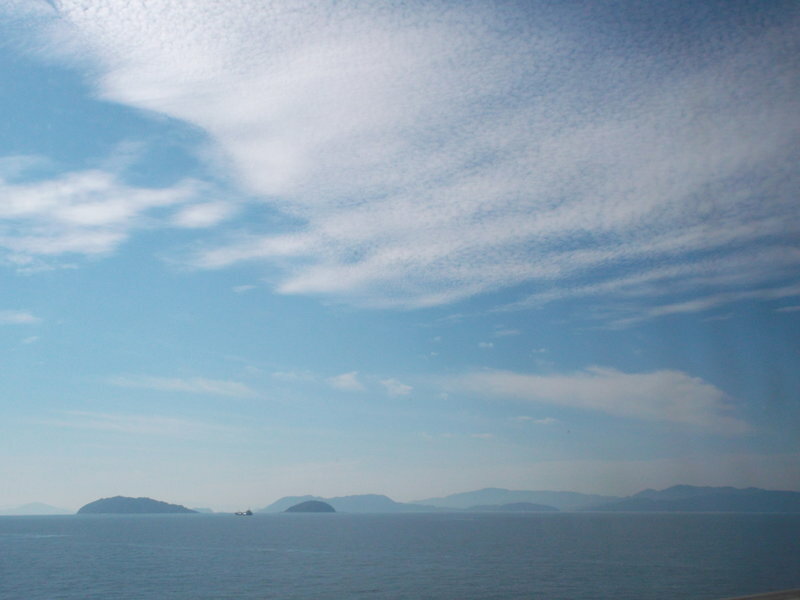 Posted on July 10, 2015 by Sara K.
Standing on the deck of the ferry, looking at little green islands on the Seto Inland Sea. 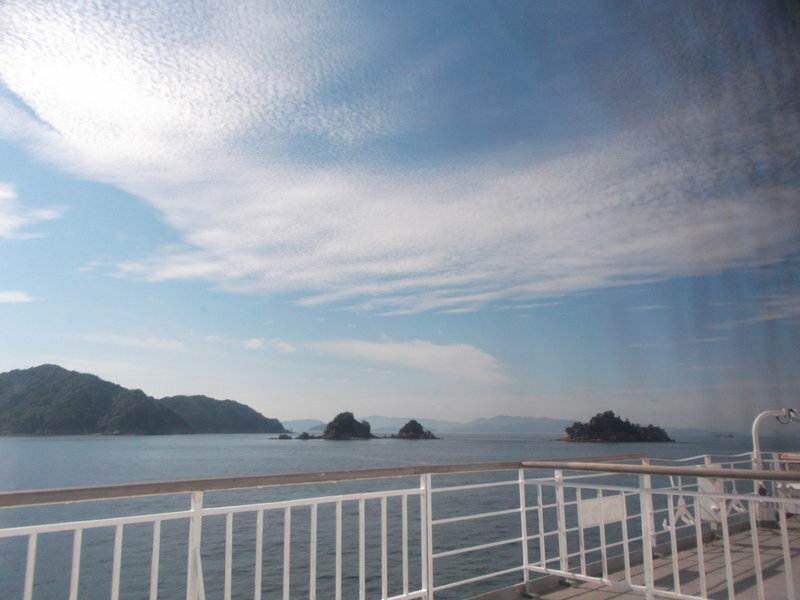 As I was reaching the limit of my entry stamp to Japan, it was time to leave Shikoku. 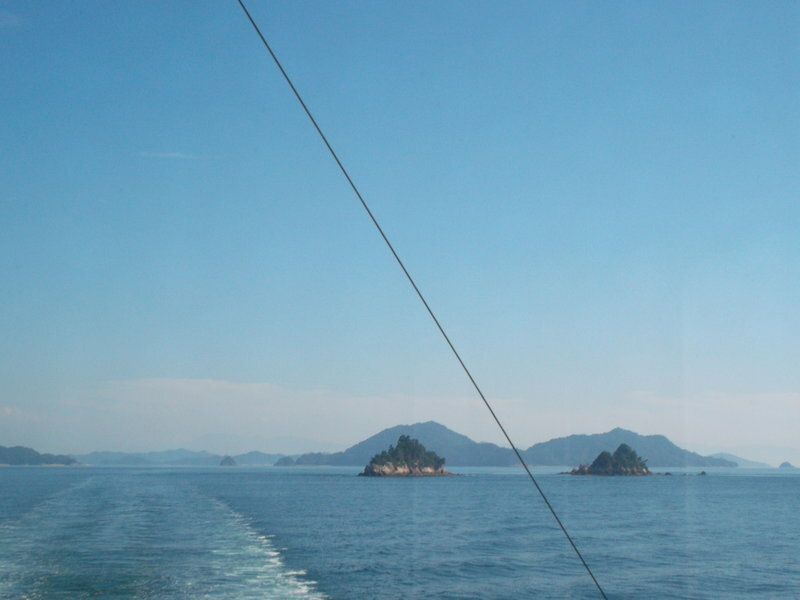 My next major destination was Busan, South Korea, so I took a ferry from Matsuyama to Hiroshima, where I could catch a train going west to Yamaguchi, where I spent my last night in Japan. A map of the ferry route between Matsuyama and Hiroshima. The public ferries actually depart from a terminal which is not so close to Matsuyama City Center, so I had to catch a bus (not tram!) to get there. There were some Russians at the bus stop who were trying to get a bus to the airport, and naturally their bus came way earlier than mine. Once on the ferry, I was able to relax. 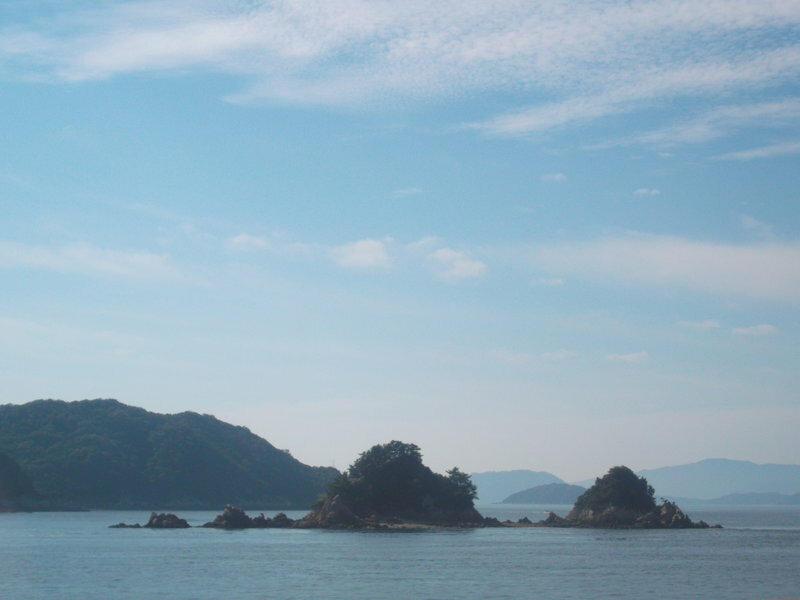 It was a sunny day, with views of various little islands on the Seto Inland Sea. 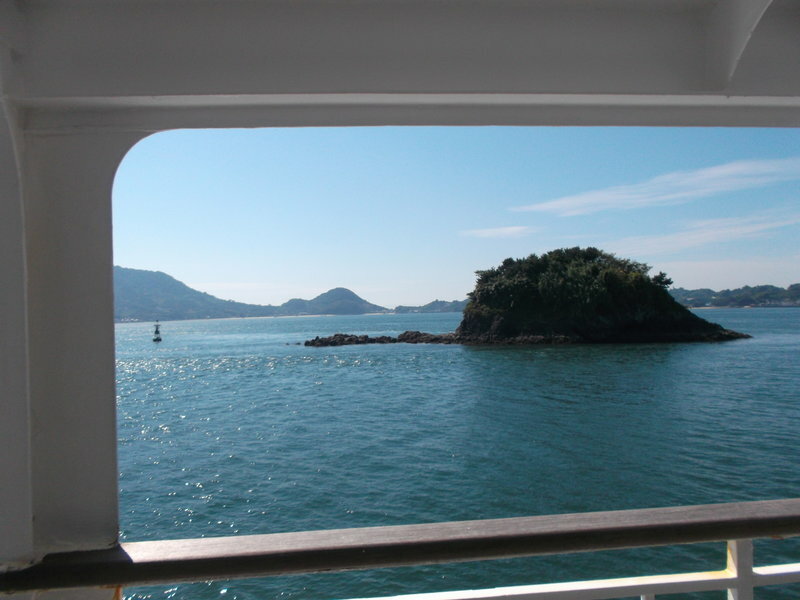 I enjoyed taking ferries in Japan, and one of the pleasures is comparing their amenities. This ferry had pachinko and slot machines, which are uncommon (at least on the ferry routes I used in Japan). The pachinko and slot machines were popular with the male passengers. There were also some video games from the 1990s. Nobody ever played them. 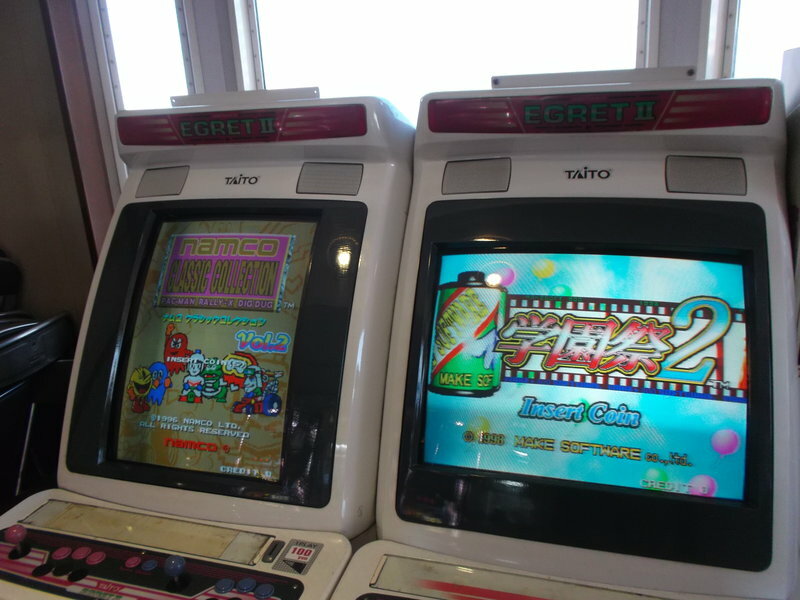 My guess is that these video game machines were bought in the 1990s, and the ferry company just never bothered replacing them, even after these games fell out of fashion. I decided to partake of the massage chair. 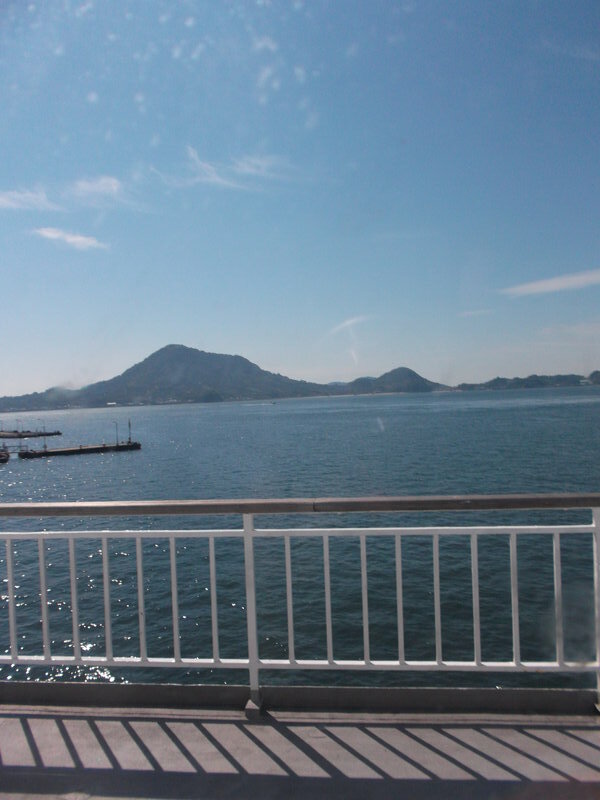 I wasn’t going to need my leftover yen anymore after 48 hours, and I was never going to get another opportunity to get a massage while I looked over at the Seto Inland Sea. It took nearly three hours to get to Hiroshima, from where I took a tram to the main train station. To quote my diary “I underestimated the slowness of the Hiroshima tram! No! I’ve been to Hiroshima, I should know better. Oh well, I got to see more of Hiroshima and its terrible traffic.” I think I once saw a list of the Japanese cities with the worst commuter traffic, and I think Hiroshima got the #1 place. I can believe that. I think it took nearly two hours to get from the port to the train station. I didn’t get to the ryokan in Yamaguchi until 10pm. Fortunately, the women who run the ryokan were very understanding and welcoming when I finally arrived. 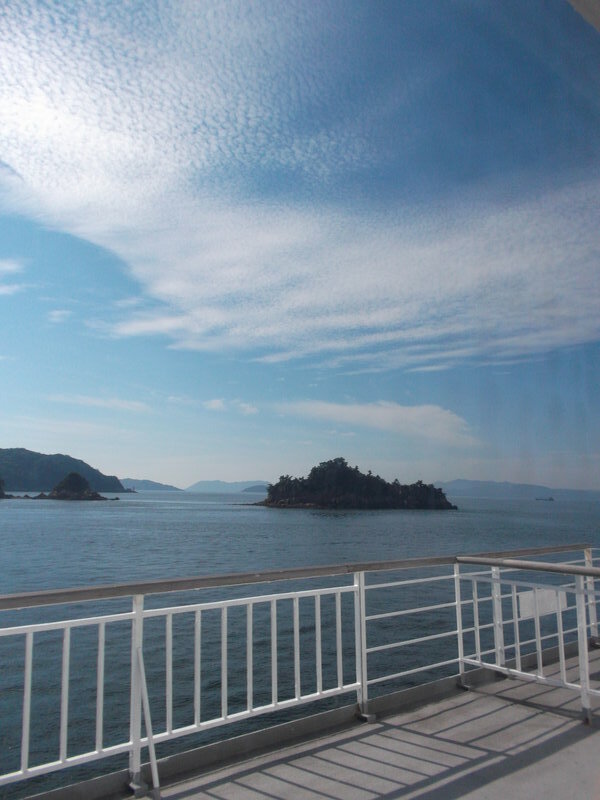 The next day, I visited Akiyoshi-do (one of the largest limestone caves in Asia), and then went to Shimonoseki to board a ferry to Busan. If you want to know more check out my South Korea travel blog. So that was the end of my six days in Shikoku. 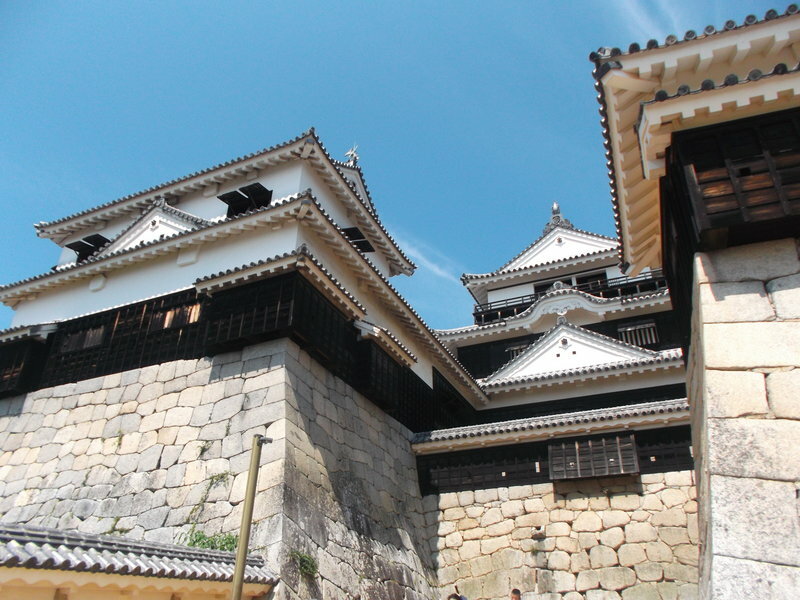 Or rather, my six days in northern Shikoku. 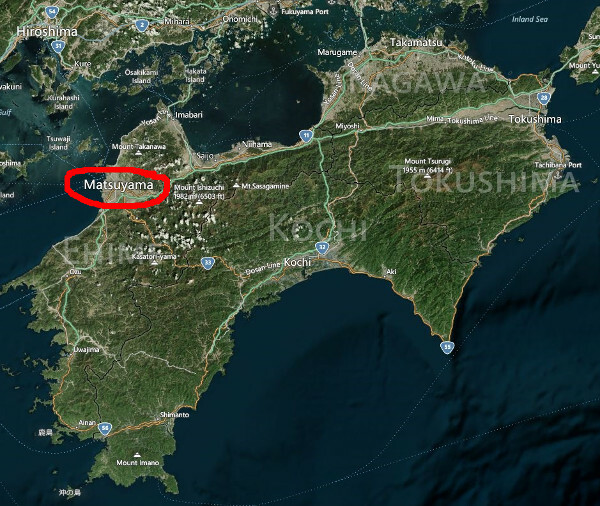 If you look at the map below – which shows my path through Shikoku – you’ll see that I didn’t go to southern Shikoku at all. 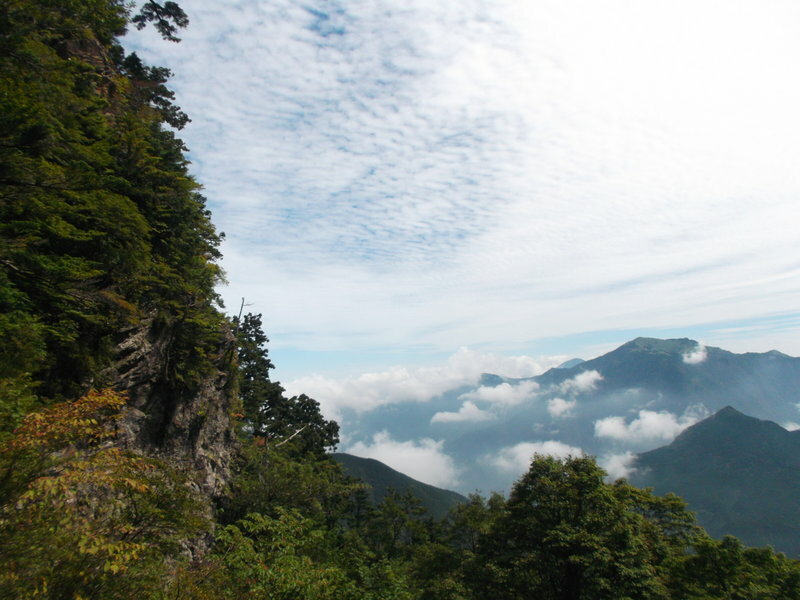 Of course, the vast majority of Shikoku’s population lives in the north, thus most of the cultural heritage is in the north as well, and the most significant mountains (Ishizuchi and the mountains around the Iya Valley) are in the north as well. And finally, as I’ve said, the north has much better public transportation. 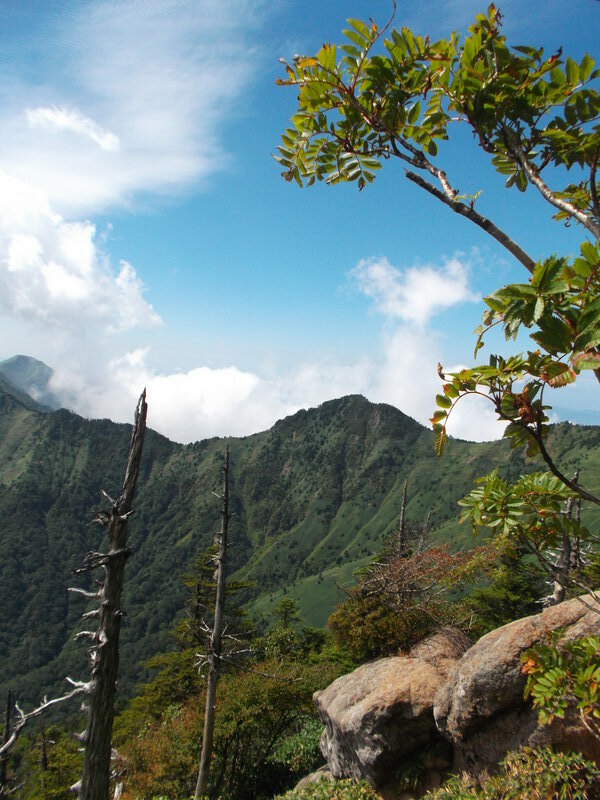 Of course, I actually wanted to go to southern Shikoku precisely because it’s more remote, rugged, sparsely populated, and mysterious. However, due to my time limitations, it simply wasn’t practical, and I definitely packed in a lot more sightseeing in my precious six days by staying in the north. 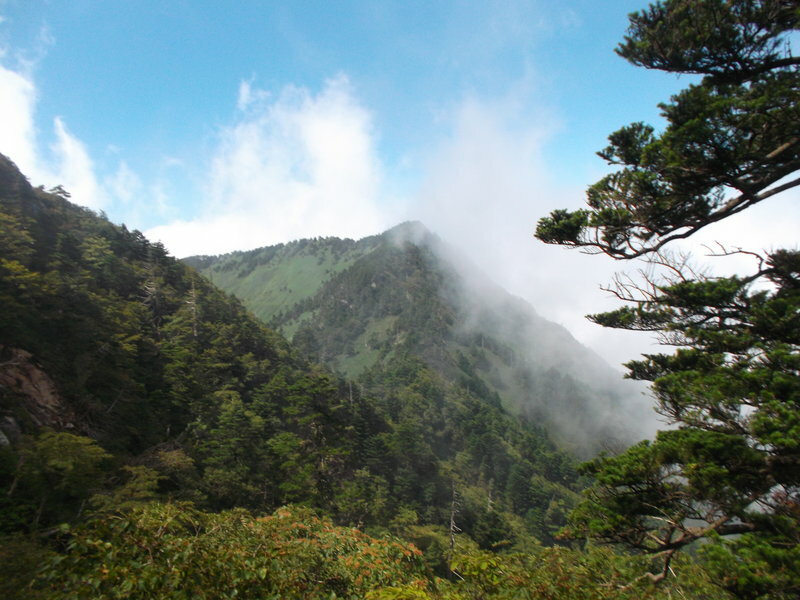 Besides, I spent 40 days in Hokkaido, so I definitely got to experience remote and rugged parts of Japan. 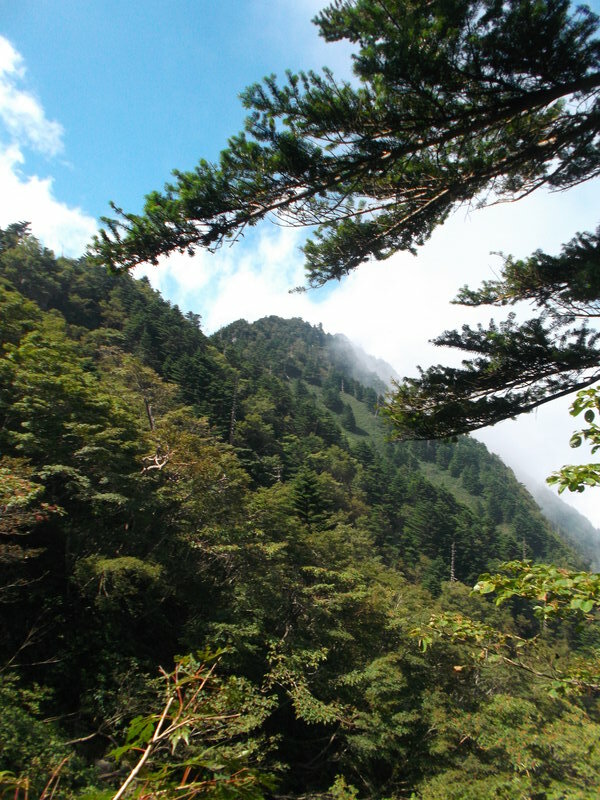 Heck, I even went to the Iya Valley in Shikoku itself, which is remote and rugged in its own right. So, what do I make of Shikoku? 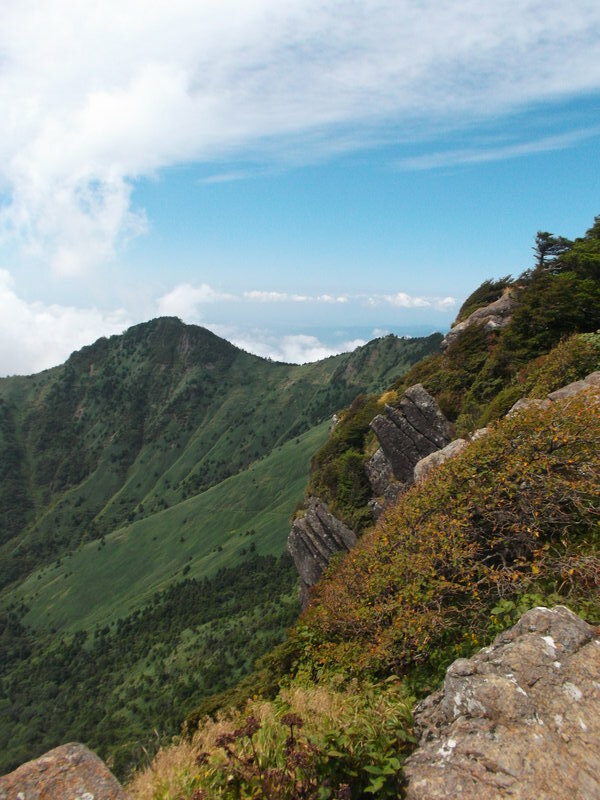 I think it’s a great place to go if you want to get a broad sense of what travel in Japan has to offer within a limited time (say, a week), or you don’t want to go over long distances, AND you’re allergic to the beaten path. 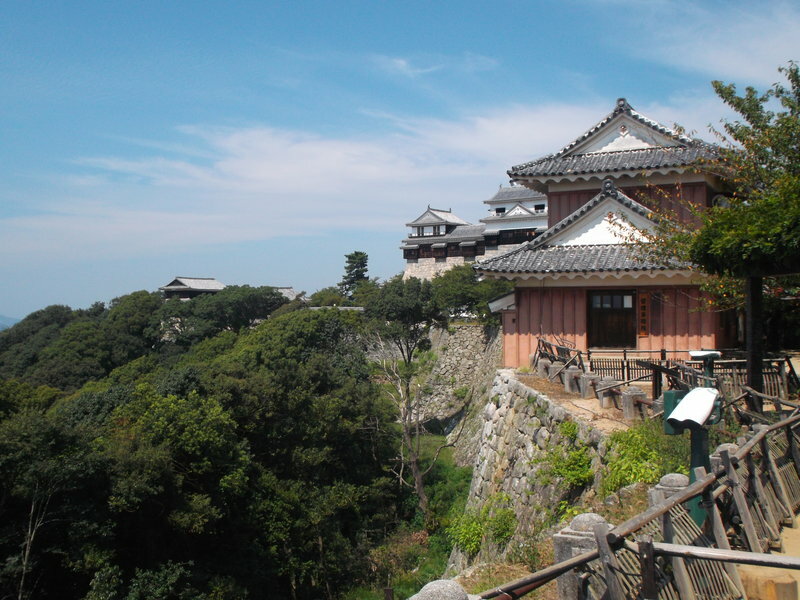 Shikoku has a fantastic traditional garden, a beautiful Edo-era castle, historic onsen (hot springs), *very* important religious/cultural sites, delicious food, the sea, the ocean, and beautiful hiking. Admittedly, it does not have any megapolis like Tokyo, Osaka, or Sapporo, but I personally don’t miss that. 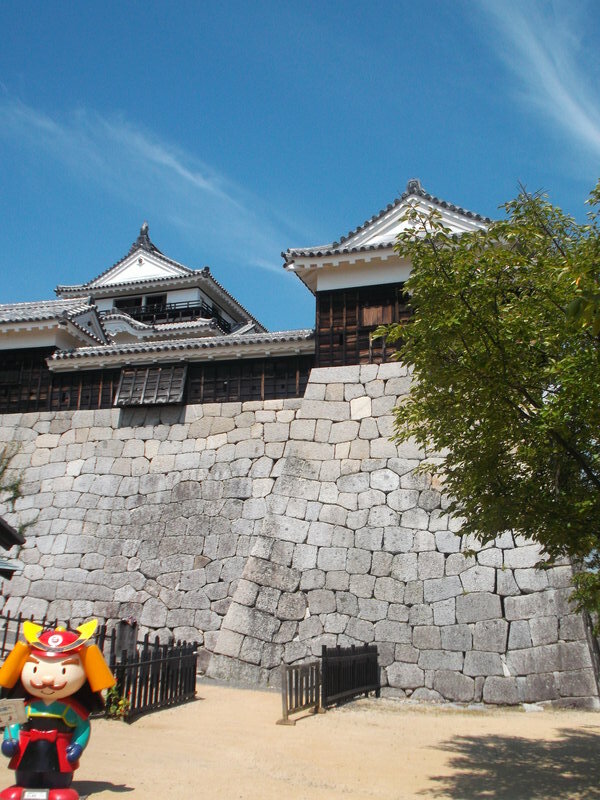 Aside from the lack of a megapolis, Shikoku is like a mini-Japan with some excellent places to visit. And I strongly encourage people to get off the beaten tourist path in Japan – it seems like 90% of the foreign tourists just go to Tokyo, Kyoto, Nara, Hiroshima, Osaka, and maybe Fukuoka/Kyushu. Even when they are in those places they mostly go to certain famous tourist spots, and ignore whatever else the city/region offers. I’m not saying that the beaten path should be avoided (unless you want to avoid it, which I can understand) – I’ve visited quite a bit of the beaten path too, and some of it is very much worth visiting. I do feel that most tourists would get a lot more out of their trip to Japan if they didn’t have the same travel itinerary as a million other tourists, and they went to at least one significant place off the beaten path. 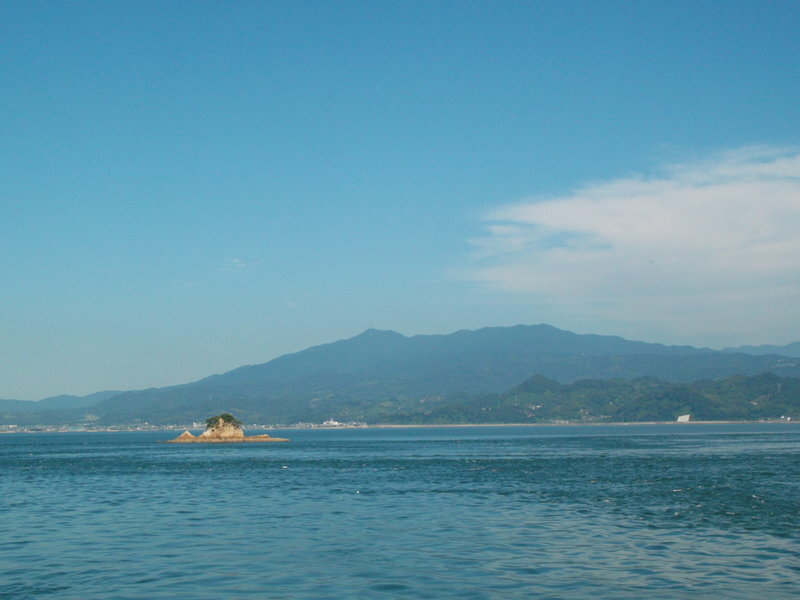 Aside from the 88 Temples pilgrimage – which really is unique to Shikoku and is island-wide – I don’t feel that there is something which is specific to Shikoku itself. Each of the four domains (Iyo/Sanuki/Awa/Tosa or Ehime/Kagawa/Tokushima/Kochi) have their own distinct traditions, and I feel that Ehime prefecture (Shikoku) has about as much in common with, say, Okayama Prefecture (not Shikoku), as it does with Tokushima Prefecture (Shikoku). 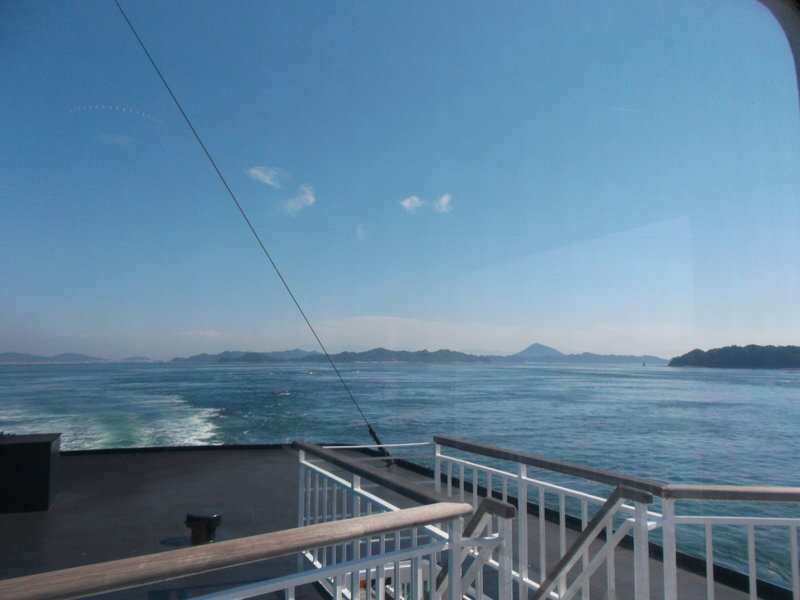 To me, Shikoku was my farewell to Japan. It was my last chance to experience these kinds of distinctively Japanese places. In other words, it was like a recap of my prior months of travel in Japan. It was a good, succinct, and meaningful recap. 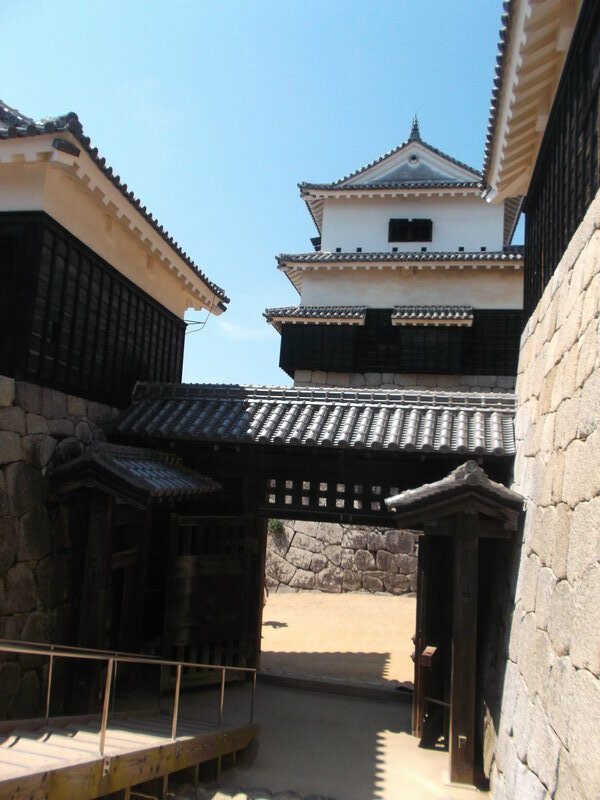 Posted on July 9, 2015 by Sara K.
I took a bus leaving the lower ropeway station of Ishizuchi-san, returned to Saijo, picked up my luggage, visited a little museum about local Saijo culture, and then hopped on a bus to Matsuyama. I was hoping the bus would be faster than the train since the train goes all of the way north to Imabari before going south to Matsuyama, whereas the bus can take the roads which go straight from Saijo to Matsuyama. Well, there are two shortcut roads between Saijo and Matsuyama, and while one of them is a freeway, the bus stuck to the slow road to make stops en route. However, I was rewarded for taking with one of the most memorable views of the moon I have ever seen. I’ll quote my diary “I saw the full moon roll like a marble between two mountains (maybe one was Ishizuchi?) and then roll up and launch into the air”. Alas, no photos. Upon arriving in Matsuyama, I got on a streetcar heading straight for Dogo Onsen, and then checked into Sen Guesthouse. I was greeted by the co-owner from Texas. We talked about my travel plans, and I mentioned that I was planning to go to South Korea for two months, and I found out that he had lived in South Korea for a few years. He then said “If you get bored of South Korea, you can always go to Taiwan.” I can go to Taiwan? HA HA HA HA HA HA. 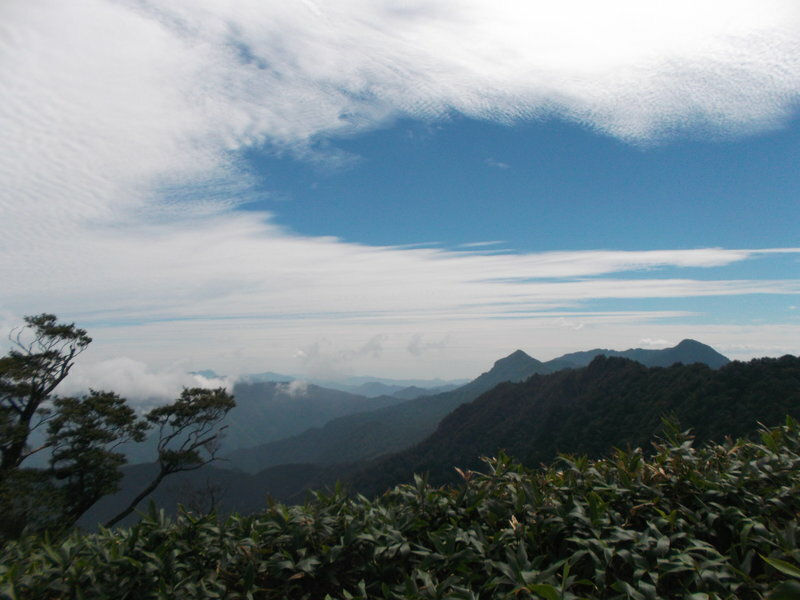 I then explained that I had lived in Taiwan for three years. 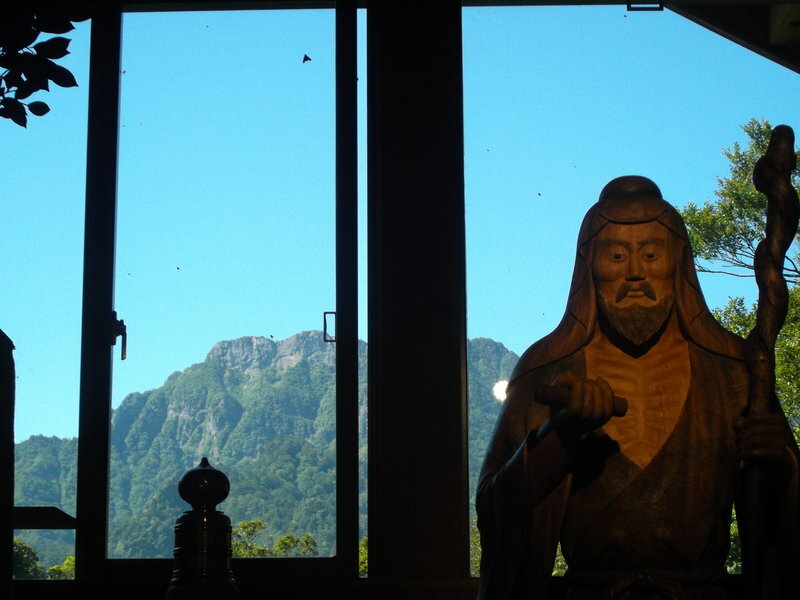 It turns out that he had never been to Taiwan, but he really wanted to go. Much as I enjoy talking to guesthouse owners, I also really want to soak in an onsen (hot spring), and Sen Guesthouse is only a five-minute walk away from Dogo Onsen, one of the oldest developed onsen in Japan. 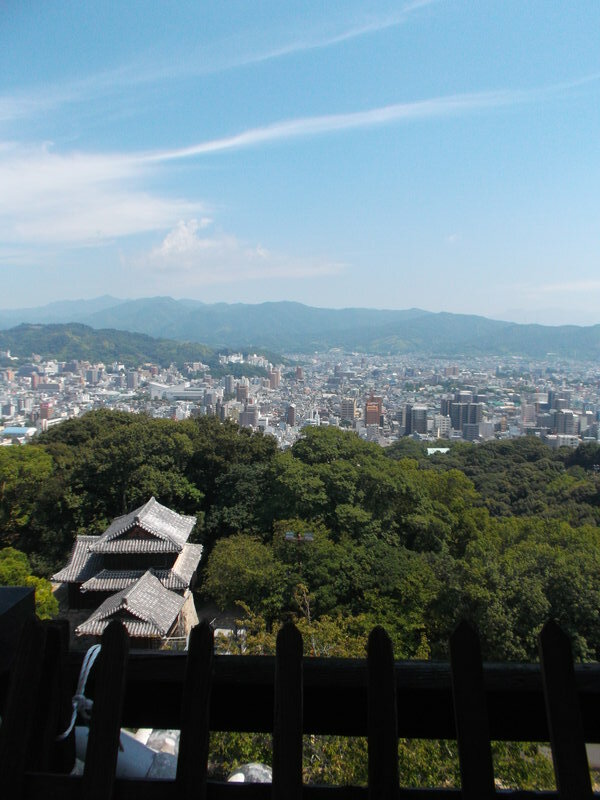 I went for the deluxe package at Dogo Onsen – hey, if I’m only going to be there once, why not go all the way? I went to both the large and the small female baths – the water is the same, but the large bath feels like a busy Roman bathhouse, whereas the small bath (which is only for people who pay the higher price) feels calmer and more intimate. I know that the water is supposed to have amazing properties but … I wasn’t impressed. As I’ve said, I went to a lot of onsen in Japan, so I got pretty high standards. To me, the water at Dogo Onsen isn’t in the same league as Yunomine Onsen in Wakayama Prefecture (which has the oldest bathhouse in all of Japan – it’s even older than Dogo Onsen), Noboribetsu Onsen in Hokkaido, or Tsuru-no-yu in Akita Prefecture. But hey, a hot spring soak is a hot spring soak, and after a hike even soaking in a bad onsen like Kusugawa Onsen in Yakushima is nice (note: never go to Kusugawa Onsen unless you are desperate for a bath or you are desperately curious about bad Japanese onsen), and Dogo Onsen is way, way, way better that Kusugawa onsen. What makes Dogo Onsen special is everything aside from the water. The architecture of the building itself is noteworthy (it helped inspire Miyazaki’s Spirited Away, though I didn’t really appreciate it since it was at night and its exterior is not well-lit. If you go for the more expensive option, it is the most deluxe treatment you’ll get at an onsen short of staying overnight in an onsen ryokan. 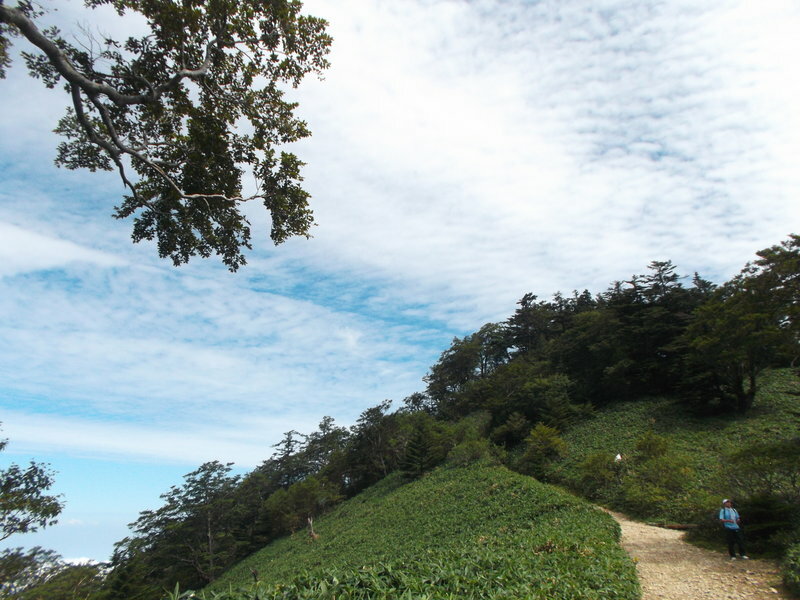 There is a special rest area where, among other things, I wrote in my travel diary about hiking up Ishizuchi-san. It was nice to observe the other people lounging around. There was also an LED scream showing colorful patterns. The most special part, however, was seeing the baths built for the exclusive use of the imperial family. Apparently, they haven’t been used since the 1950s since nowadays the imperial family just uses the baths in whatever hotel they stay at in Matsuyama rather that go to the public bath. 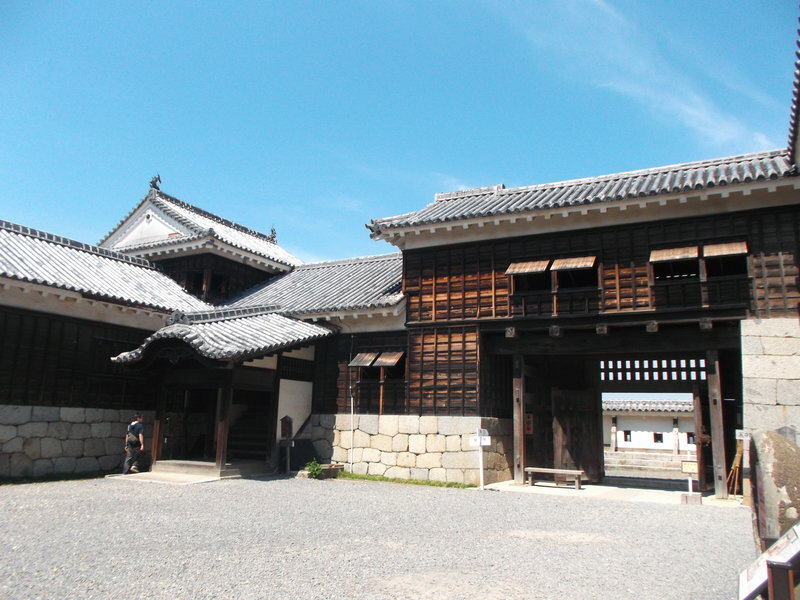 The guide explains the significance of many difference features of the imperial bath, and it is impressive just how much gets lavished on the Japanese imperial family simply because of their royal status. It wasn’t so much the luxury – I imagine you could get something just as luxurious at a good onsen ryokan for about 200 USD per night (i.e. it’s within reach of the upper middle class), but all of the particular details and specific rules of the proper way to treat the imperial family because they are the imperial family. Among other things, photography is forbidden, so I didn’t take any photos in the imperial baths. Sen Guesthouse is a good guesthouse. The lounge area is chill. They also have a very interesting selection of books, including Dogs and Demons (which I first encountered in Oboke), which I read some more of. 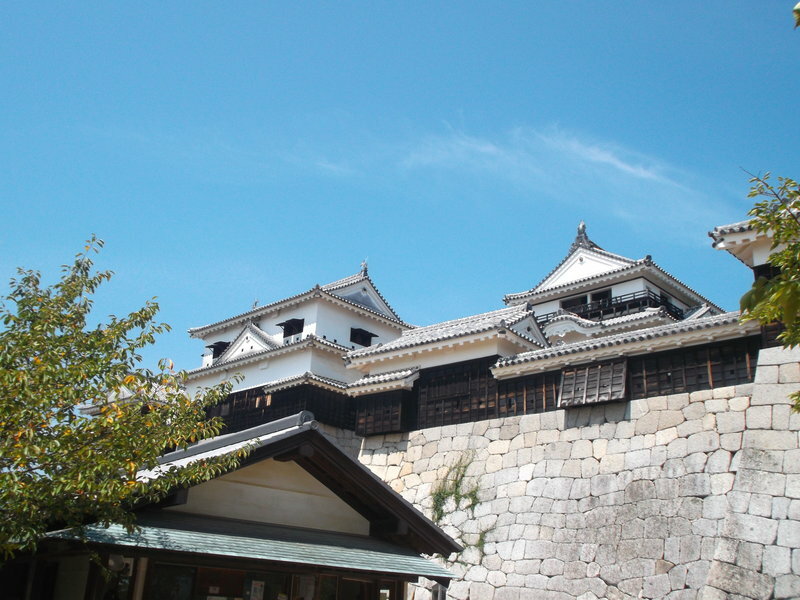 A lot of the books were about religion, which makes sense, since Sen Guesthouse caters to henro passing through Matsuyama (if you don’t know what a henro is, read this post). Furthermore, I cooked some of the best food I ever cooked in Japan in that kitchen at Sen Guesthouse. Other guests even commented on how good it smelled. Thank you, Muji to Go, for supplying such tasty ingredients. 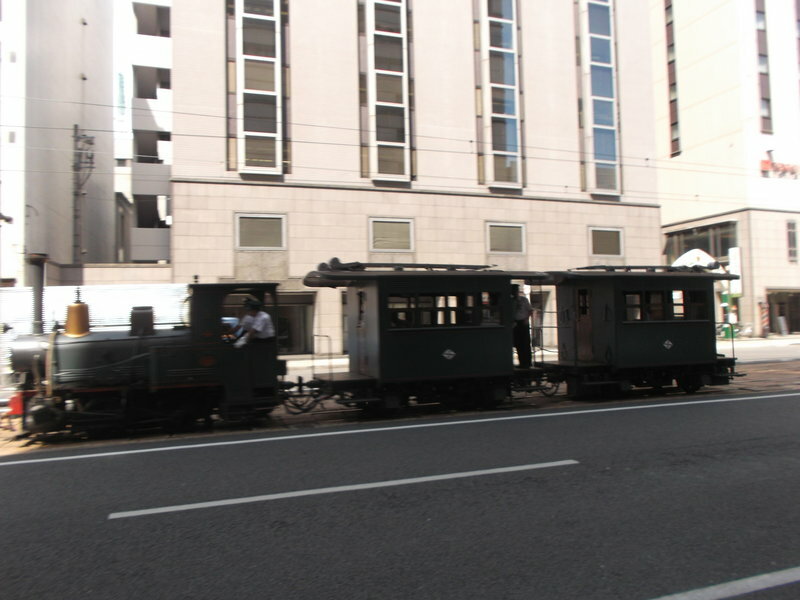 The next day, I saw the nostalgia chibi choo-choo train in the photo above making its way on streetcar rails. 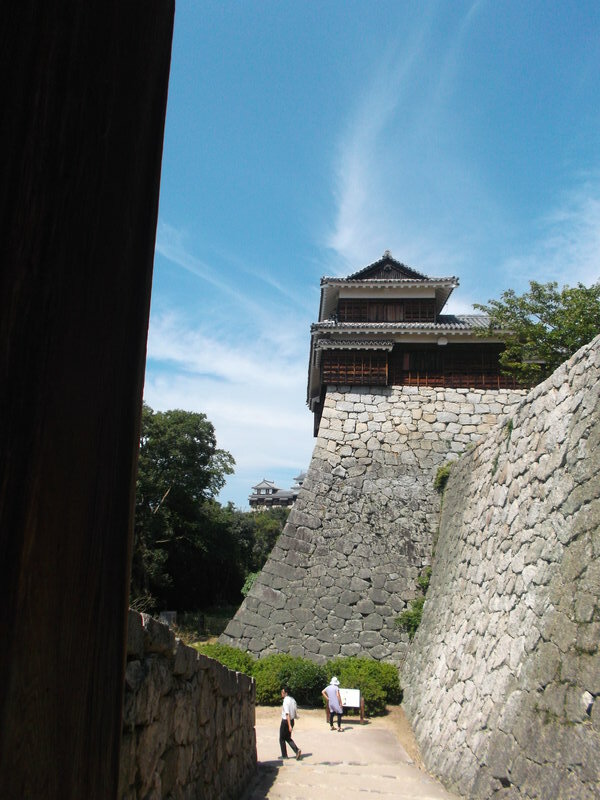 I basically only had time to see one thing in Matsuyama that day before I had to leave Shikoku, and naturally I chose to see Matsuyama Castle (note: nearly all of the photos in this post show Matsuyama Castle since, unlike Dogo Onsen, there aren’t rules against photography there). I could have just walked up, but there is a chairlift and a cable car (why? ), and since the chairlift was inexpensive, I decided it would be the fun way to go up. 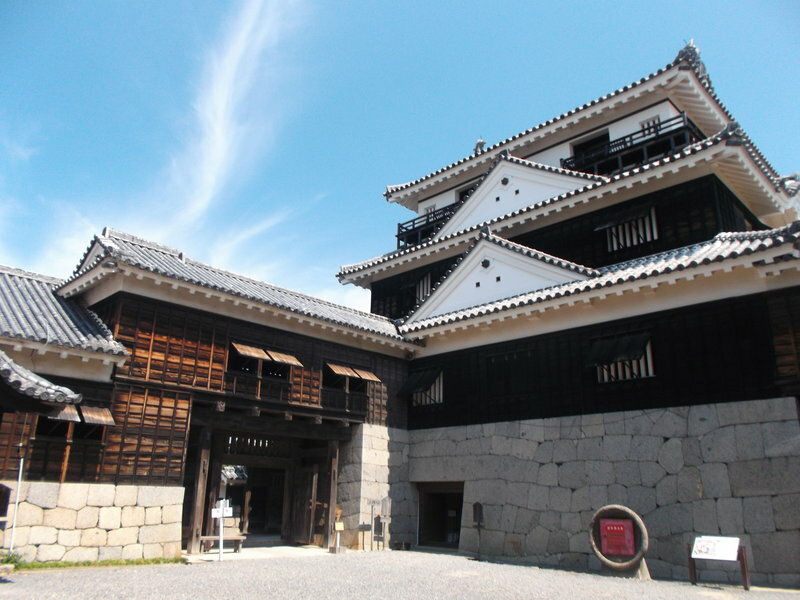 I had already seen Kumamoto Castle, Himeiji Castle (supposedly the greatest castle in Japan), Shikone Castle, Inuyama Castle, Kanezawa Castle, and my favorite, Matsumoto Castle. 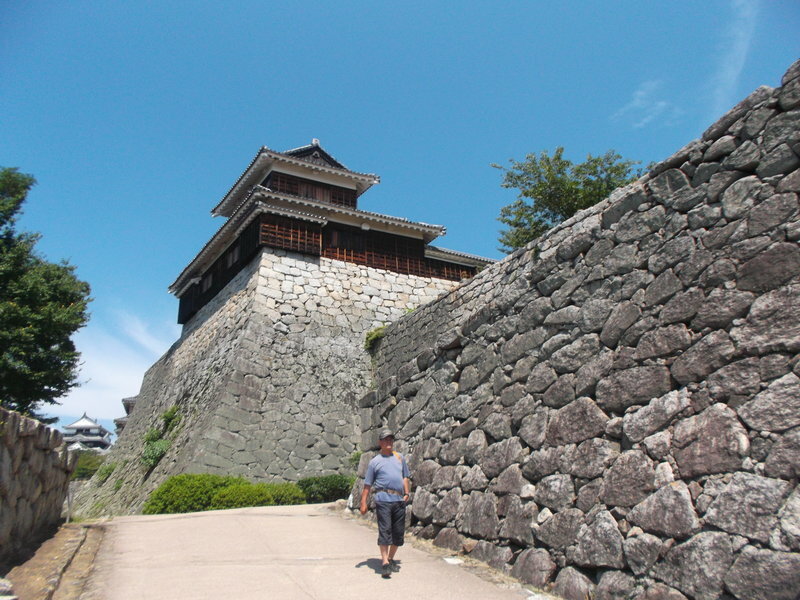 Just as I felt I had seen enough temples, I also felt I had seen enough castles, and that Matsuyama caslte wouldn’t make any impression on me. 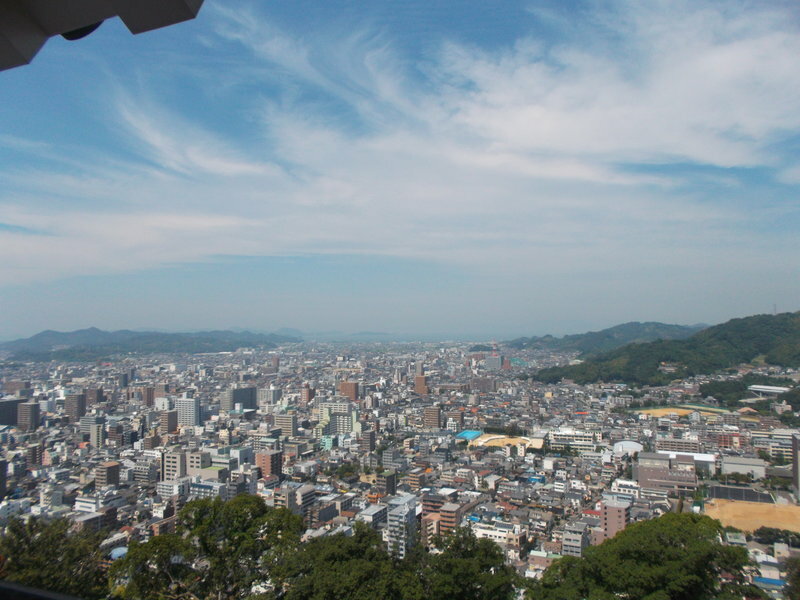 First of all, Matsuyama Castle has excellent views over the city – some of the best views I ever saw looking out from any castle (note: I visited Shikone Castle during hazy weather, so I did not get great views over Lake Biwa). The castle itself, however, is also lovely in its own right. 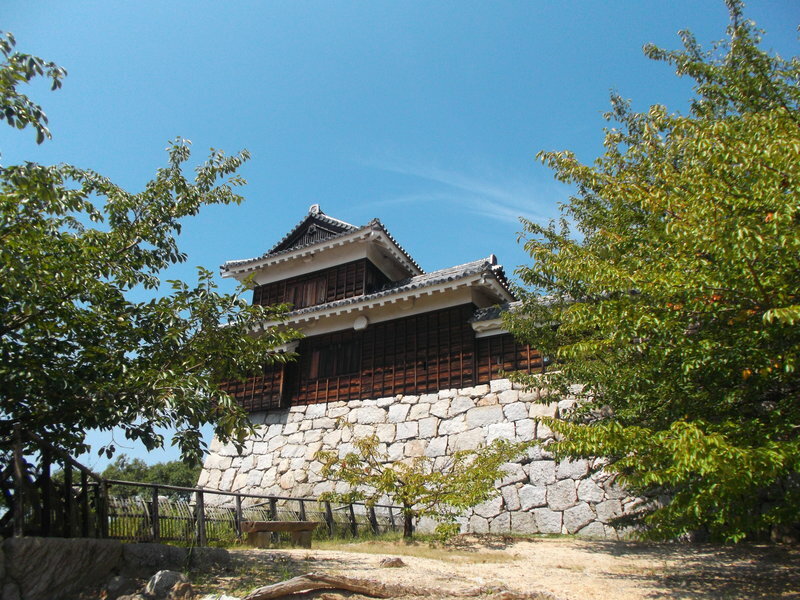 It is the last castle which was (re)built during the Edo period, and that is the structure which still stands there, so it has an authentic quality that castles rebuilt in the 20th century lack. 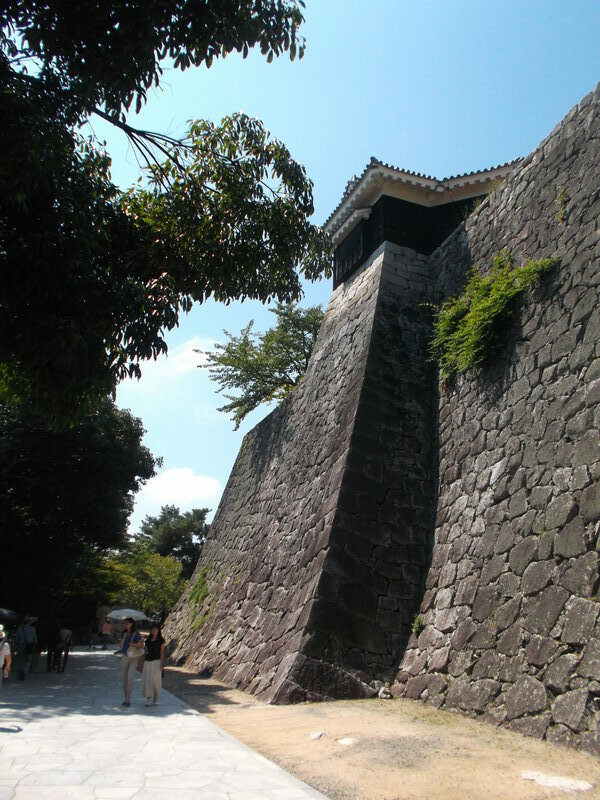 Perhaps I loved Matsuyama castle for the same reason I loved Konpira-san – just as Konpira-san and Zentsuji were the last major religious places I would visit in Japan, Matsuyama was my last Japanese castle. 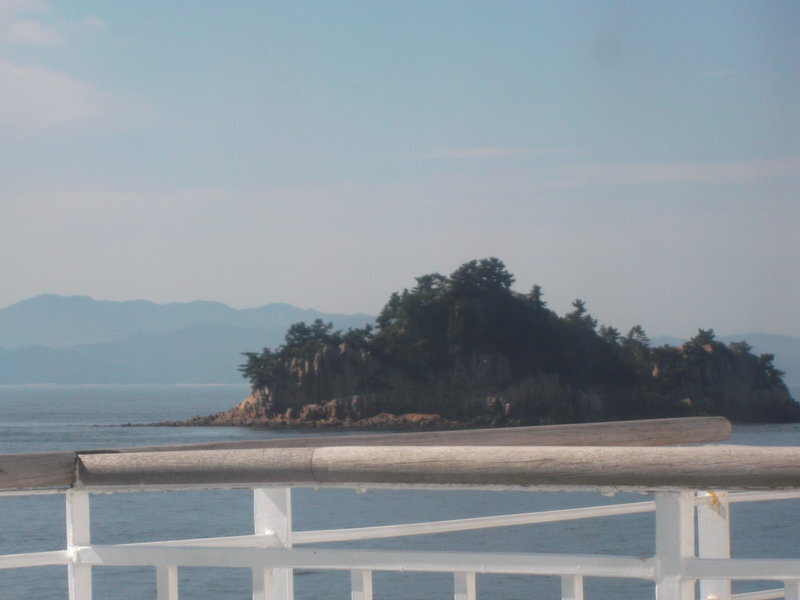 The next and final post in this series will describe my journey out of Shikoku, and present some concluding thoughts. Posted on July 7, 2015 by Sara K.
This is it! 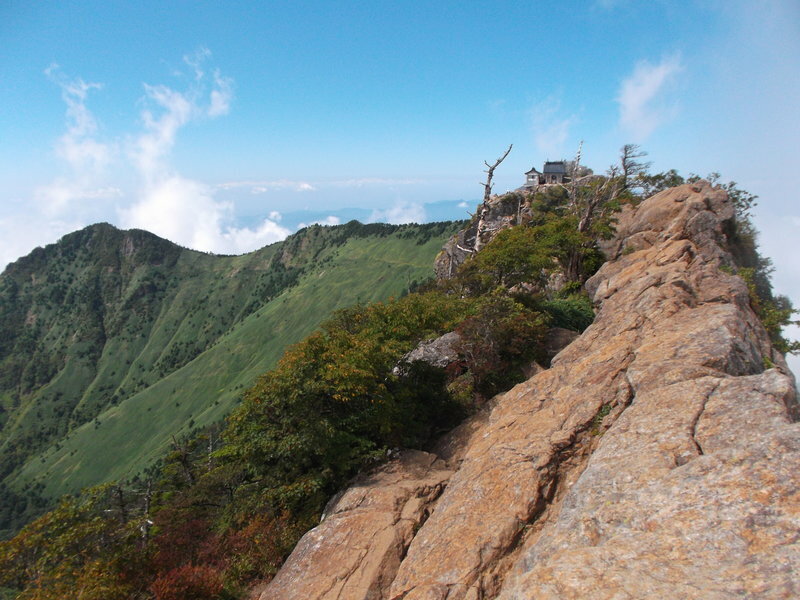 This is the top of Ishizuchi-san, the highest mountain in western Japan. 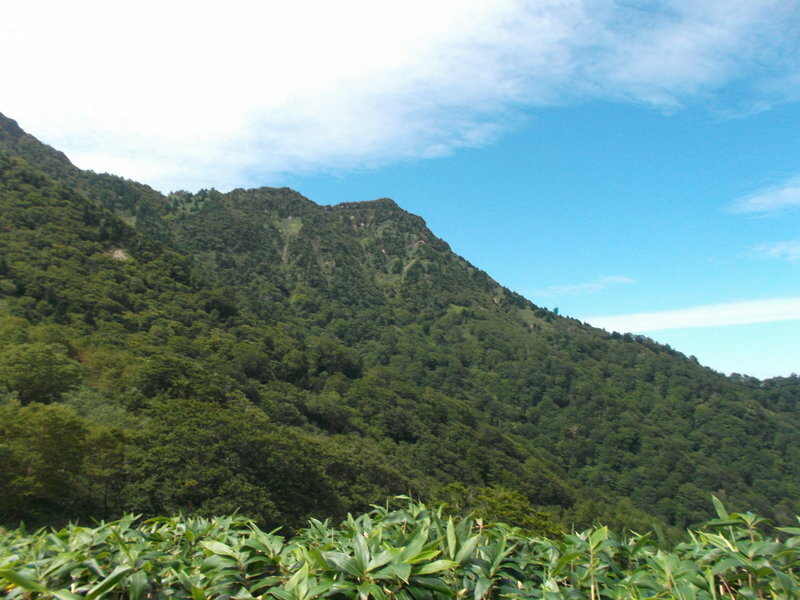 Once I got up to Ishizuchi-jinja, the sight of the green mountains which lay beyond dazzled me. 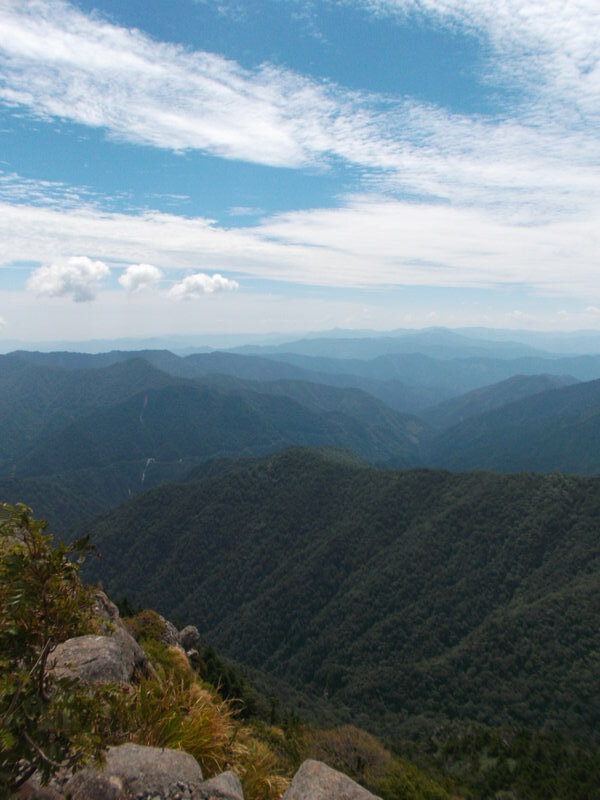 Here’s a panorama shot of the Green Mountains Behind Ishizuchi-san (i.e. 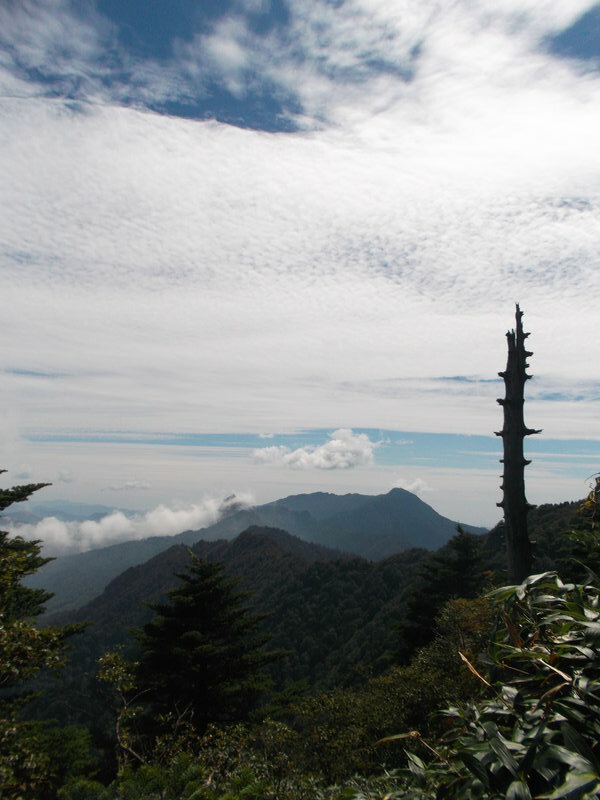 the Rugged Heart of Shikoku). 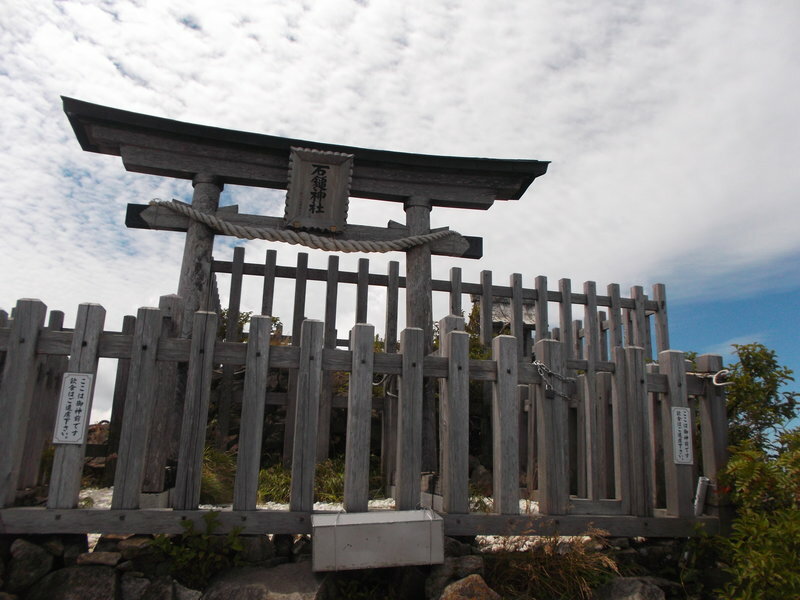 I saw Ishizuchi-jinja itself, the very important shrine on Misen (the peak at 1974 meters). Taking photos of the interior of the shrine is forbidden, so if you want to see it, you’ll have to go in person. Since you can’t see what’s inside the shrine in this photo, this photo is OK.
By itself, the shrine doesn’t look so different from a zillion other Shinto shrines in Japan. 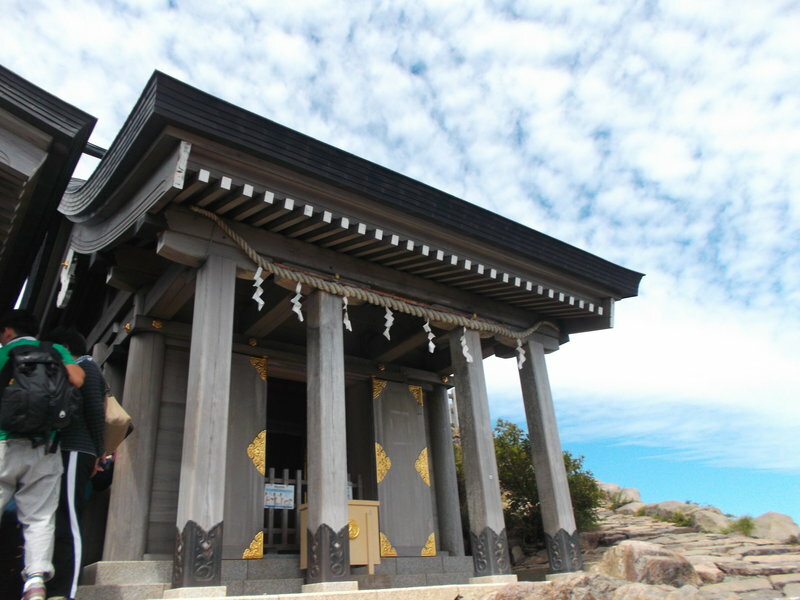 It’s when you combine the sight of this shrine with its surroundings that you start saying ‘wow’. 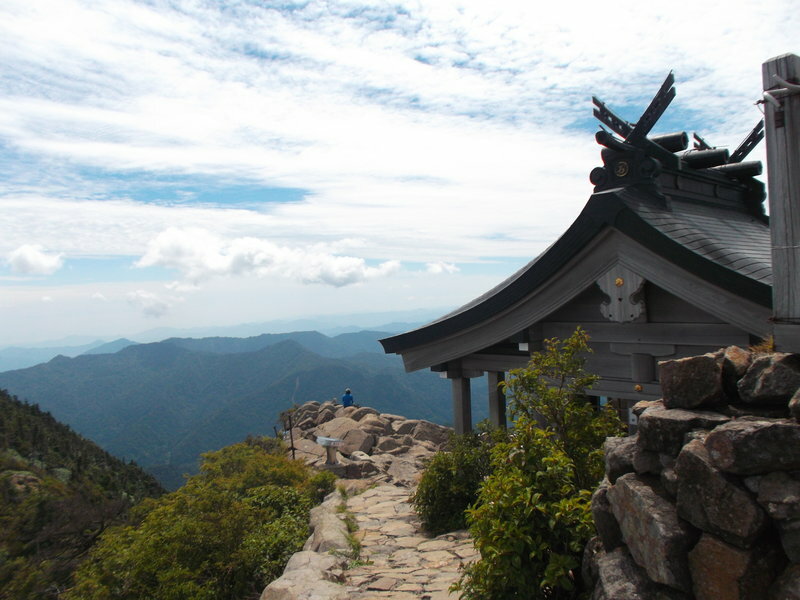 Most hikers only go to Misen, since that is where Ishizuchi-jinja is. 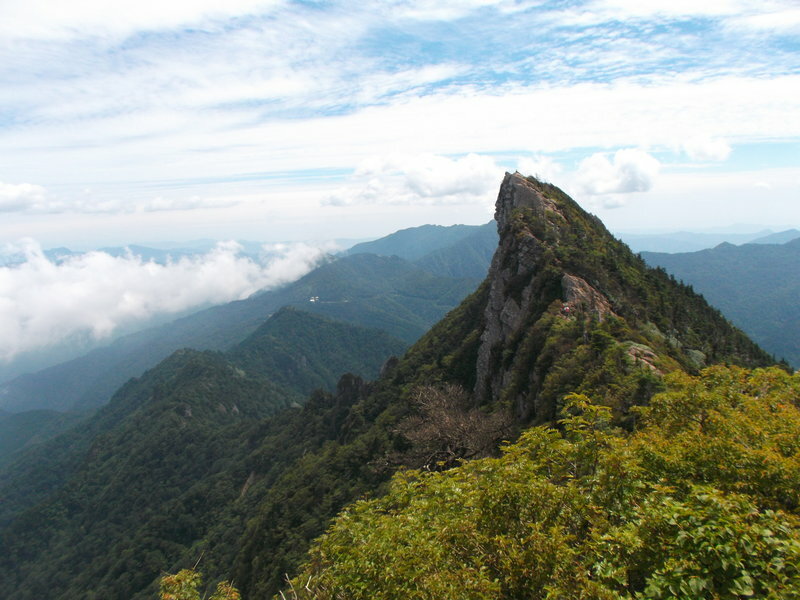 However, the true summit of Ishizuchi-san is Tengu-dake (Heavenly Dog Peak). 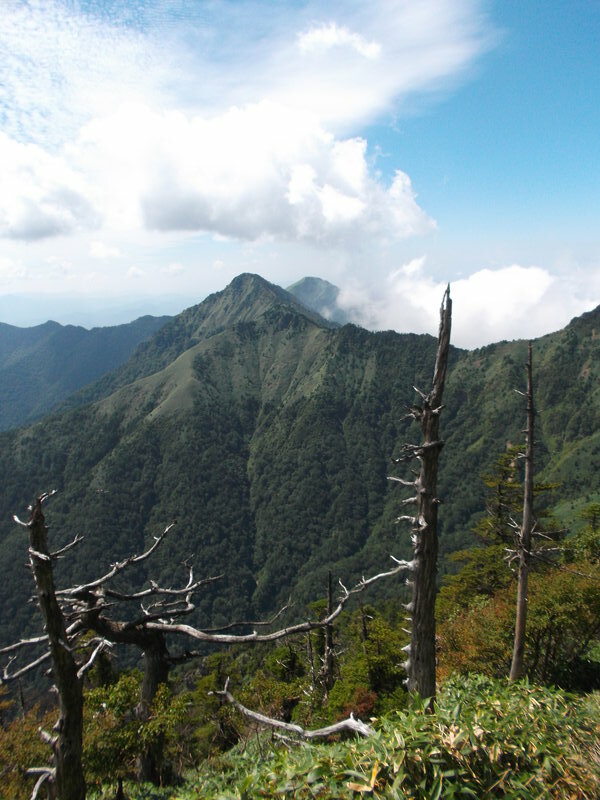 I had read that the trail from Misen to Tengu-dake was difficult, with a big drop. I wasn’t sure if I was going to do it. 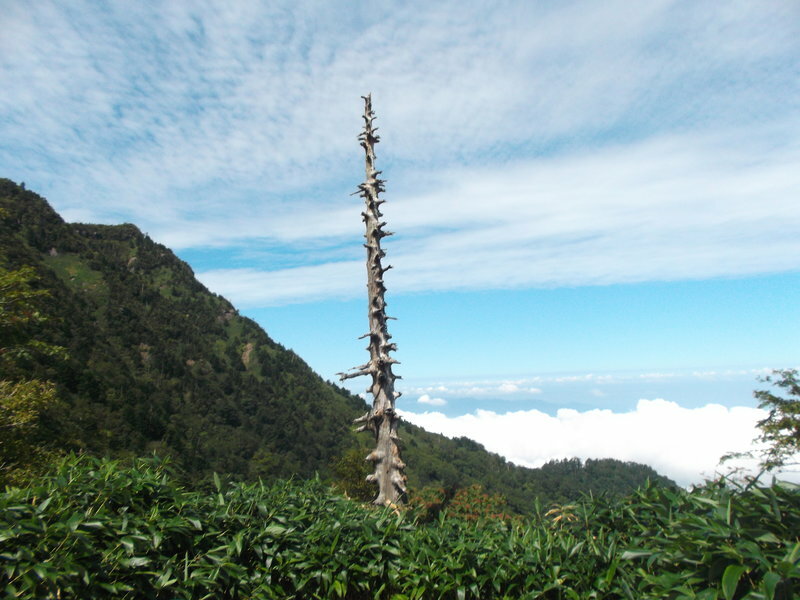 But when I saw it, I thought – heck, this isn’t any worse than a lot of the peaks I’ve climbed up in Taiwan! 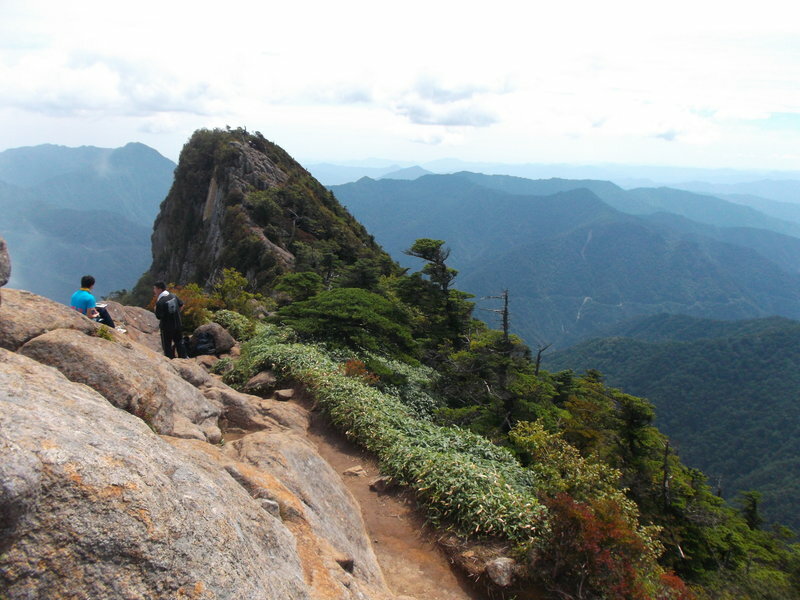 I was very grateful to Taiwan for offering so many rocky, scrambling peaks with big drops so I could build up the nerve it takes to hike up a peak like Tengu-dake without freaking out. 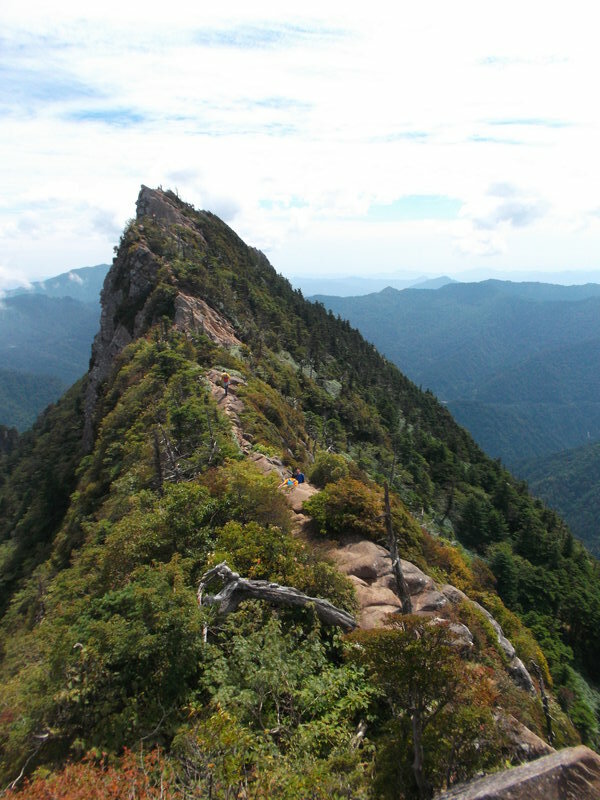 Of course, any reasonable person would be careful around sharp long drops like that, but compared to what I had been imagining the trail to Tengu-dake being like, it was relaxing. 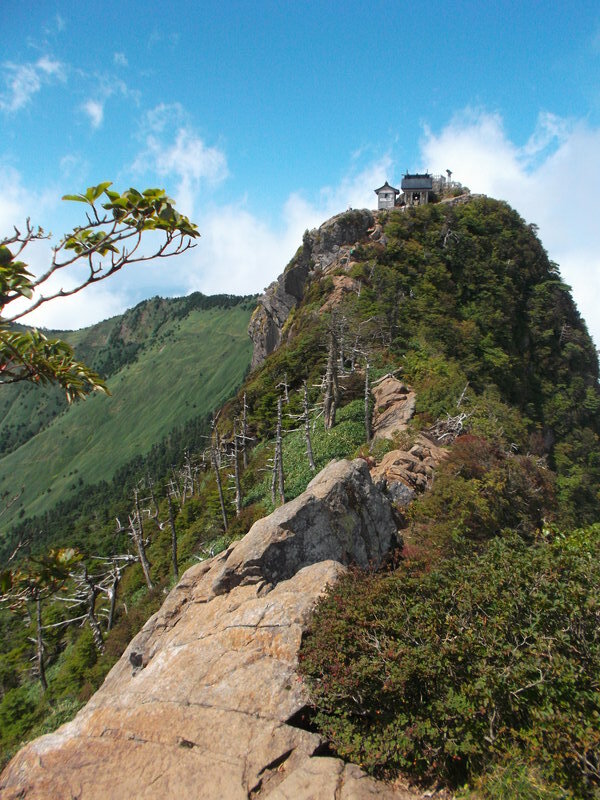 If I hadn’t built up that nerve in Taiwan, I would have felt a lot less comfortable going to Tengu-dake. 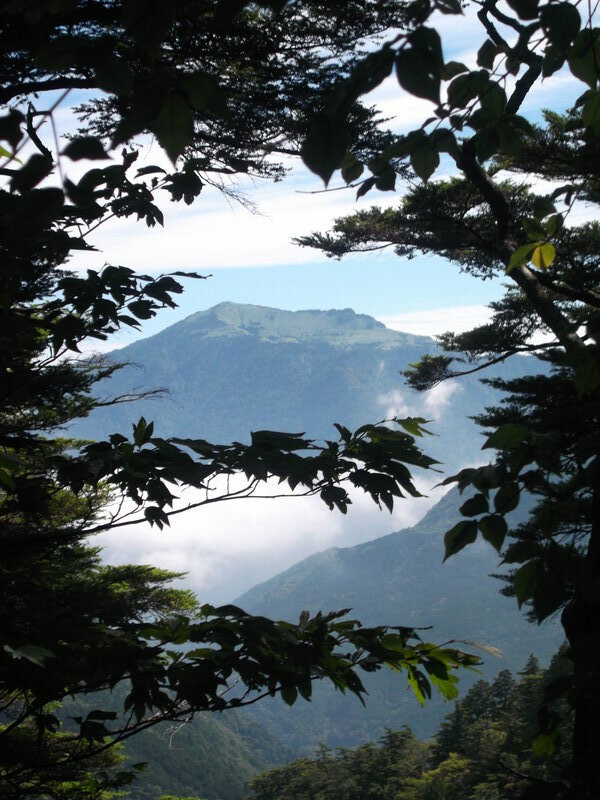 And if I hadn’t gone to Tengu-dake, I would have missed the most beautiful sight I ever saw in Western Japan. 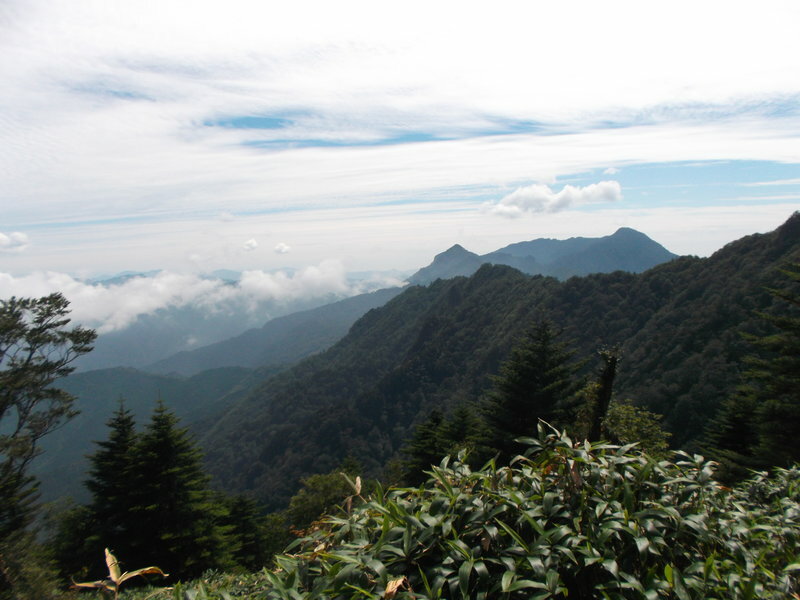 That’s right – the view from Tengu-dake looking towards Misen is the most beautiful thing I saw in all of my travels around western Japan (and I went further afield than the vast majority of foreign tourists who go to western Japan). It’s so beautiful, I’m going to show you another photo. And I’m going to show you yet another photo. Alas, I did have a bus to catch, so I made my way back to Misen. Along the trail, back to Ishizuchi-jinja at Misen. 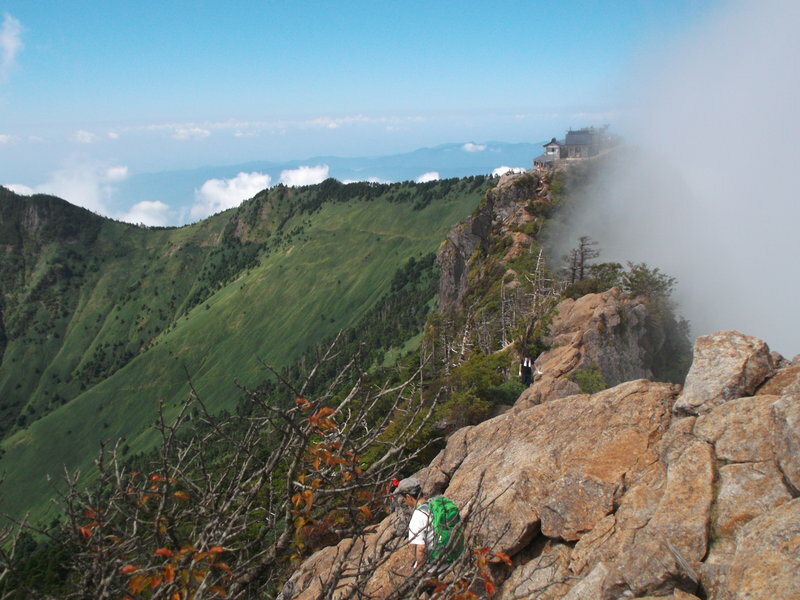 I am so glad that this was my final hike in Japan. It is one of the best. After all of this hiking, I was looking forward to soaking in an onsen. There is an onsen right by the lower ropeway station, but I was holding out because I planned to go to one of Japan’s most famous onsen that evening – an onsen which helped inspire Hayao Miyazaki’s Spirited Away. That’s right, I was going to Dogo Onsen in Matsuyama. Read about it in the next post! 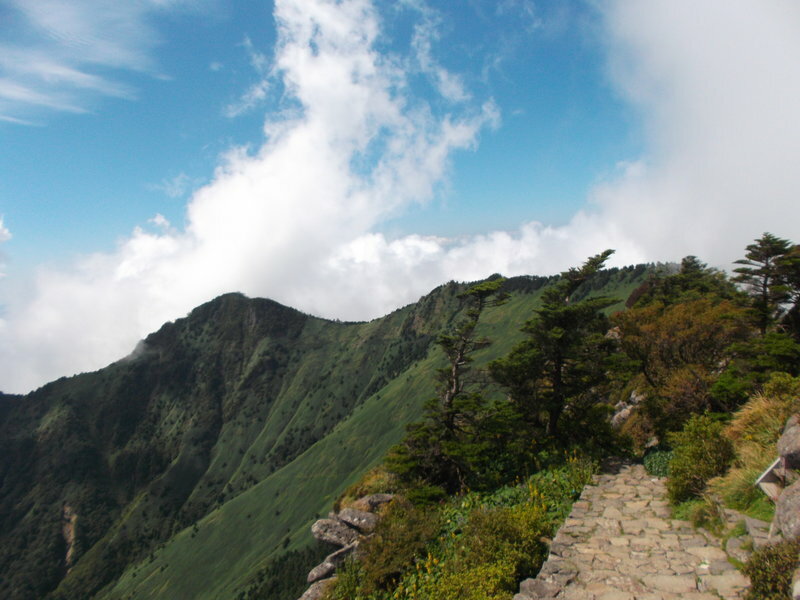 Posted on July 6, 2015 by Sara K.
One of the things I most wanted to do in Shikoku was hike Ishizuchi-san, one of the seven great sacred mountains of Japan. 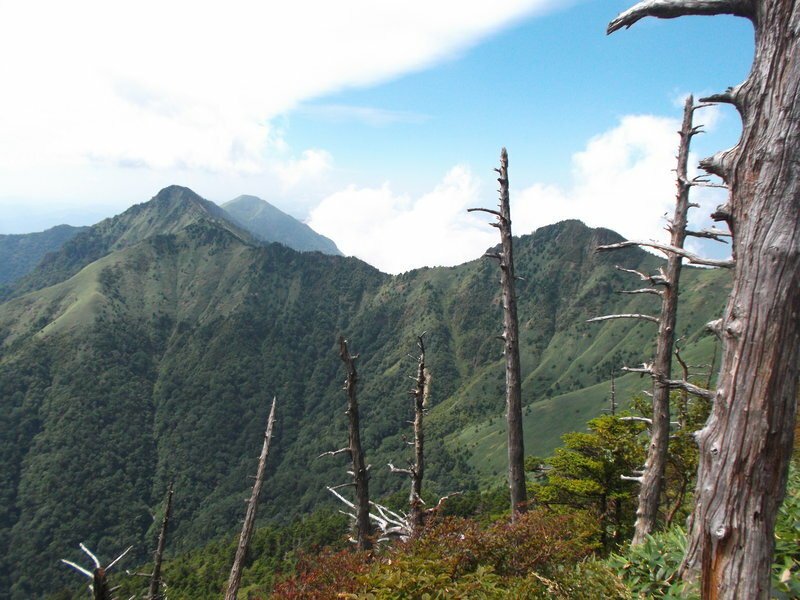 At 1982 meters above sea level, it’s also the highest peak in western Japan. It was my last hike in Japan. 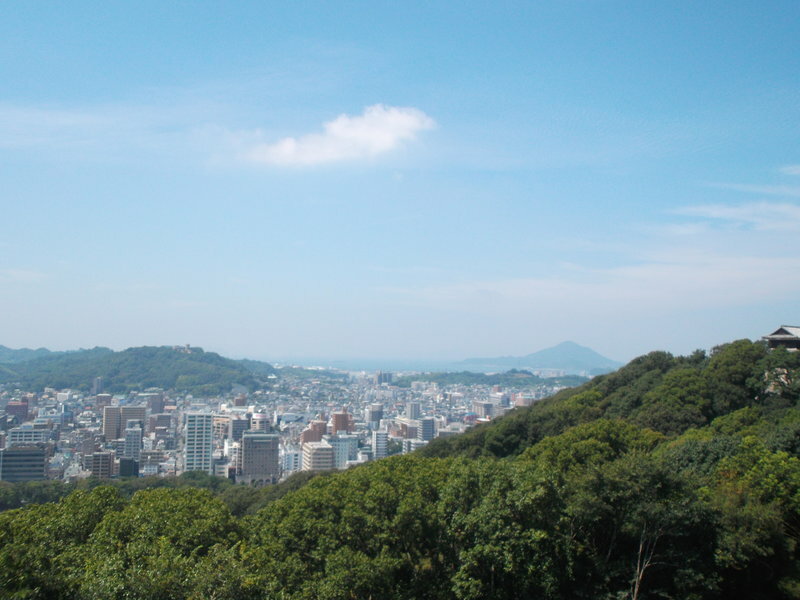 There are four buses per day from Saijo City to the Ishizuchi-san ropeway station. I took the first one. My diary says “The bus to Nishinowkawa takes a scenic route through forested hill/mountains, [with] a dammed river which cuts through a stone gorge”. The bus must have gone near one of the 88 temples, for I saw some walking henro on the road (most likely Temple 60, which is on the slope of Ishizuchi-san). 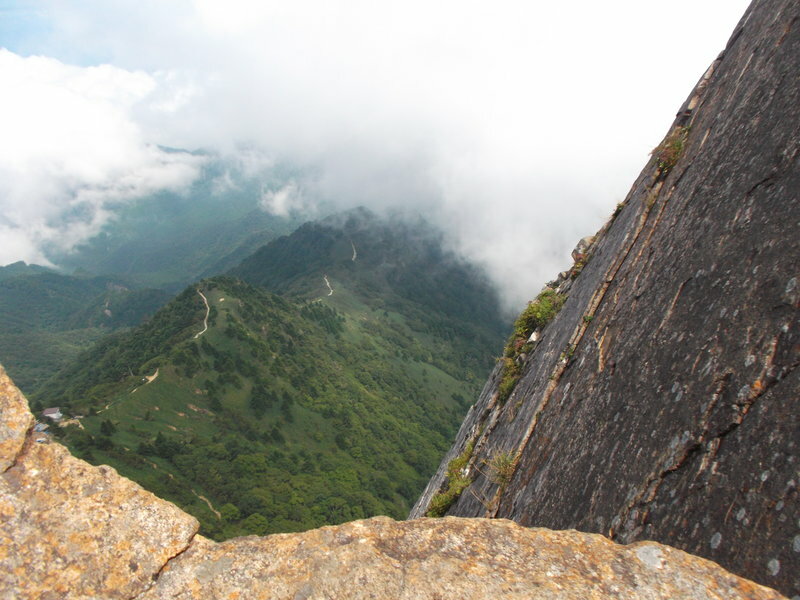 There is a trailhead near the ropeway station, and I could have done the whole hike on foot. However, given that there are only four buses per day, I figured that I shouldn’t risk missing the last bus out. Sure, I *probably* could have made it to the last bus even if I hiked without using the ropeway, but I would have been nervous and in a rush, and that wouldn’t have been much fun. So I decided to use the ropeway and enjoy the hike without worrying about missing the last bus. A quote from my diary: “The cable car whisked us up, with a good view of a green mountain on the other side of the valley”. 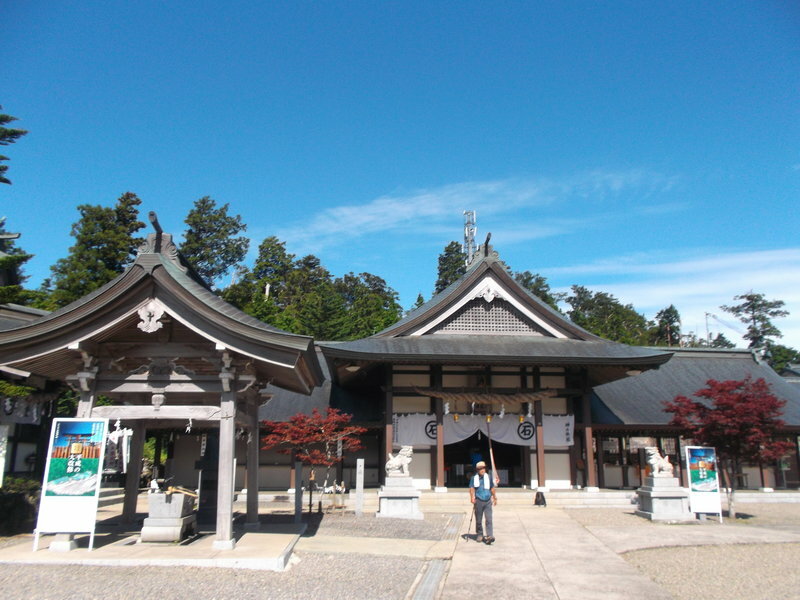 Ishizuchi is one of the most important centers of shugendo – a religious tradition which fuses Shintoism and Buddhism. It only took about 20 minutes to walk from the upper ropeway station to Ishizuchi-jinja Joju-sha, a rather large shrine complex. 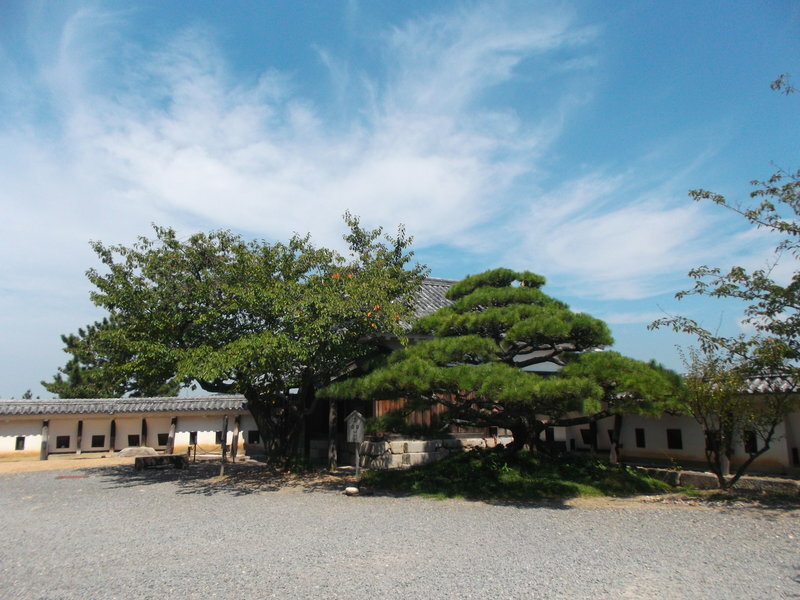 In addition to multiple buildings for worship, there are several ryokan where visitors can stay overnight (expensive), as well as shops selling things to visitors. In the windows of this room, you could see Ishizuchi-san itself. 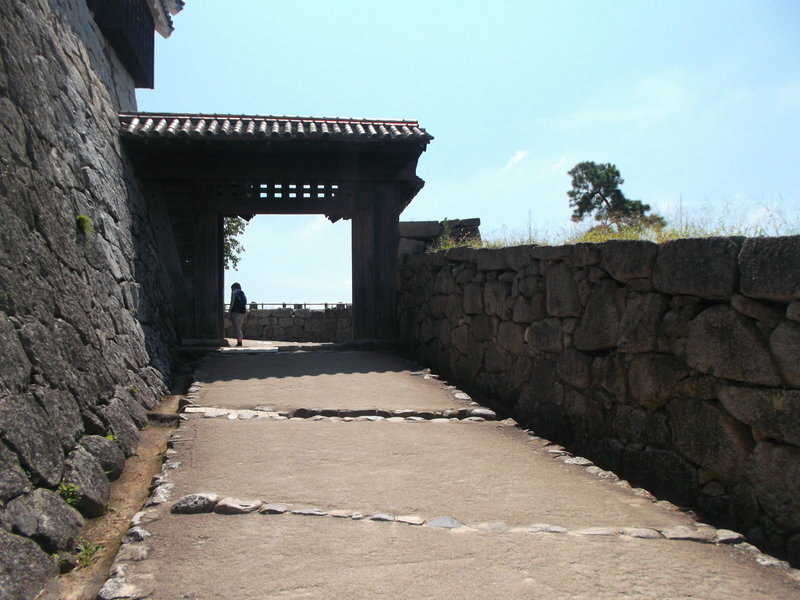 After passing through the large shrine complex, the trail went downhill, then a steady uphill again. 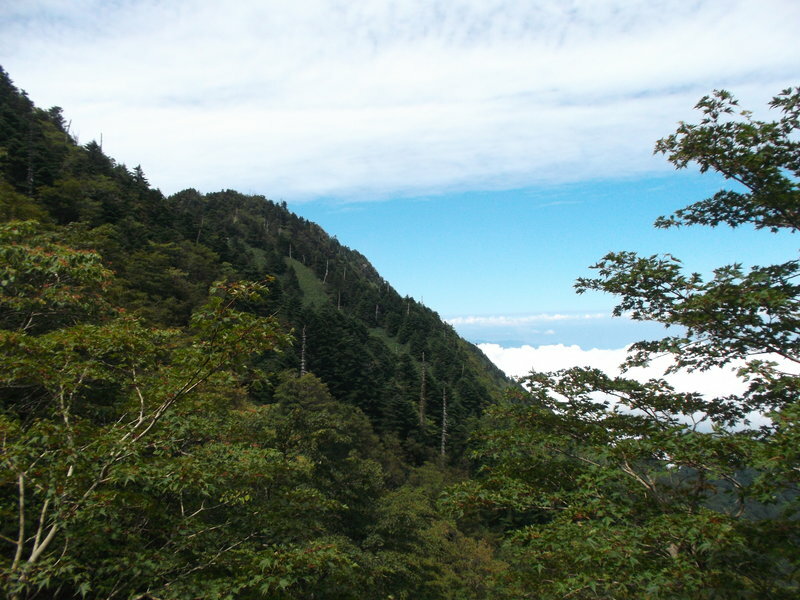 Even though September is not the hottest time of year in Japan, and we were in the mountains, everyone was sweating a little. My diary says “I was glad that most of the hike was shaded”. For centuries, women had been forbidden on Ishizuchi-san. However, the restriction on women was lifted at some point in the 20th century, which is how I was able to hike. 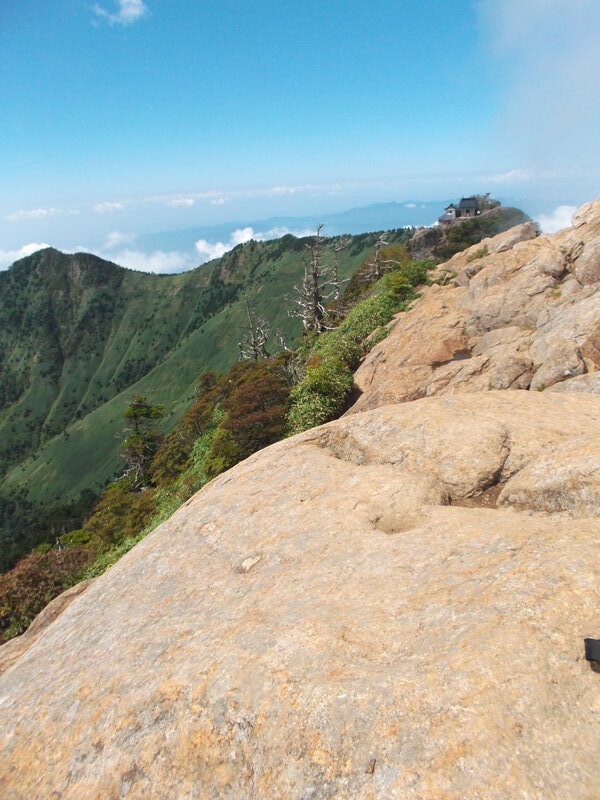 There is still one day a year when only men are allowed to hike Ishizuchi-san – fortunately for me, this wasn’t that day. Eventually, the views did open up. I’ve read that, in clear weather, it’s possible to see practically all of Shikoku, as well as the Aso caldera in Kyushu. 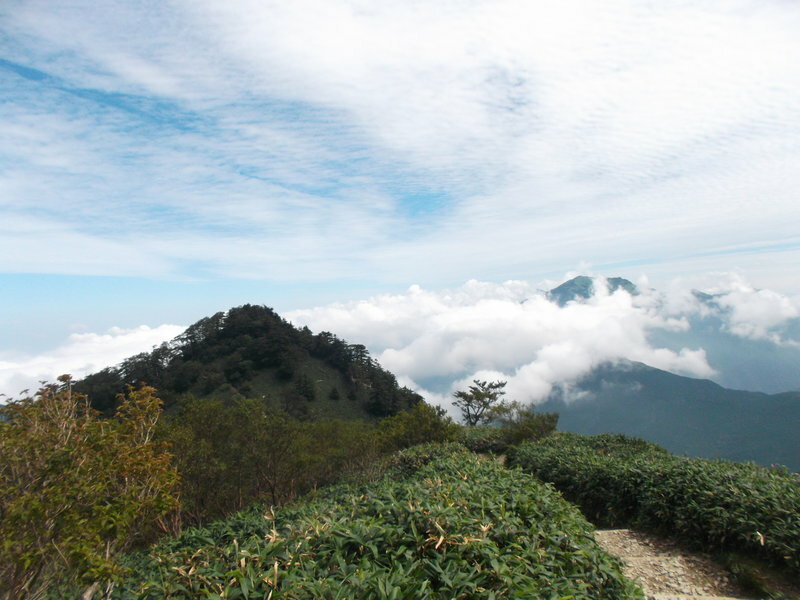 The skies weren’t that clear when I hiked, but the distant clouds have their own beauty. It seems that, at the time of my hike, they were (re)building one of the shelters along the trail. There was a helicopter bringing in supplies, and at one point I had to wait for a helicopter to clear before proceeding. The degree to which Japanese people use helicopters seems ridiculous to me. One time, I witnessed a helicopter sending supplies to a place which was only a 40-minute walk away from the nearest road – at it was not a particularly strenuous trail (this was in Yakushima). When I asked the men why they were using a helicopter, they said nobody wants to carry supplies. 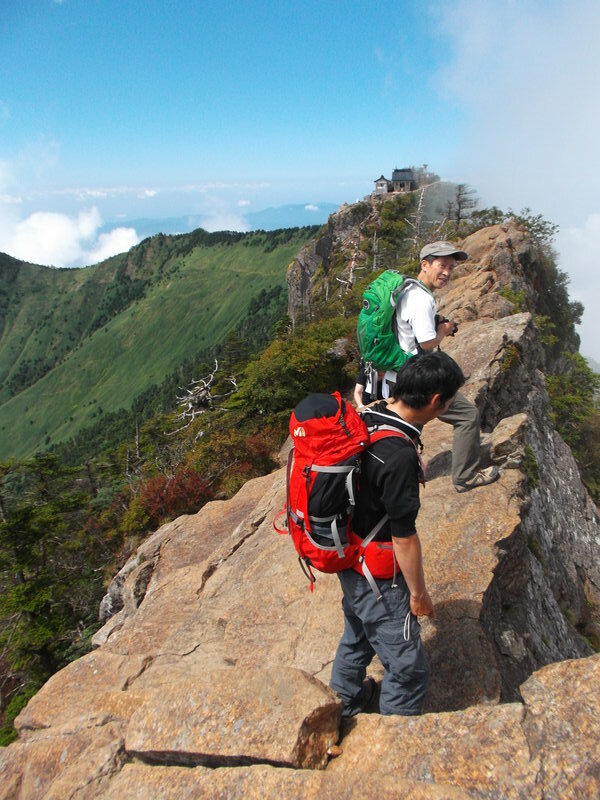 I’ve been told multiple times, by multiple people, that there are no mountain porters in Japan. This is not entirely true. I met one mountain porter in Japan. He’s from Nepal, he was hired to carry alcoholic beverages to a mountain shelter so they could be sold to hikers at inflated prices, and he was also trying to persuade Japanese hikers to hire him to serve as their hiking guide in the Himalayas. I also met a Japanese man who was making a very short portering run to resupply a mountain shelter (by ‘very short’ I mean that he only had to hike about one hour between the shelter and the nearest chairlift). 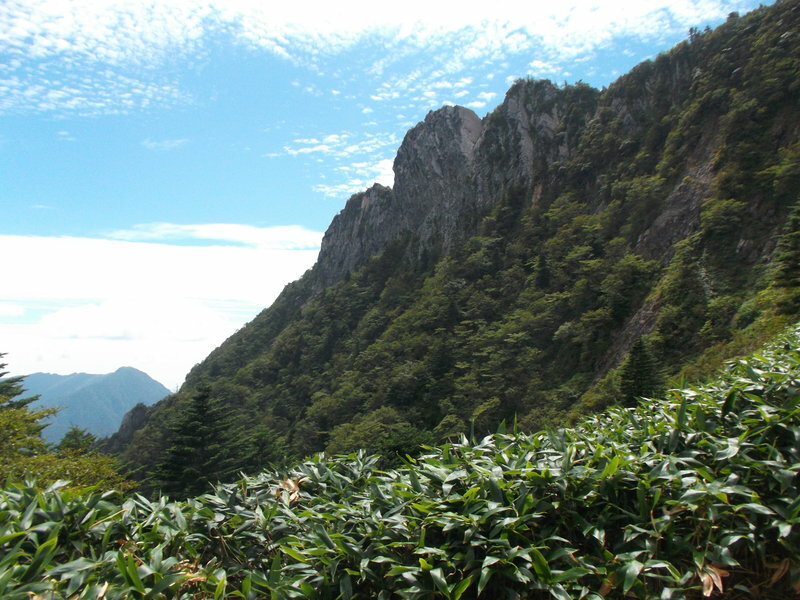 Taiwan does have quite a few mountain porters. Helicopter drops are still sometimes used in emergencies or for supplies which are particularly difficult for porters to handle, but porters are the default means of moving supplies in areas inaccessible to motor vehicles. 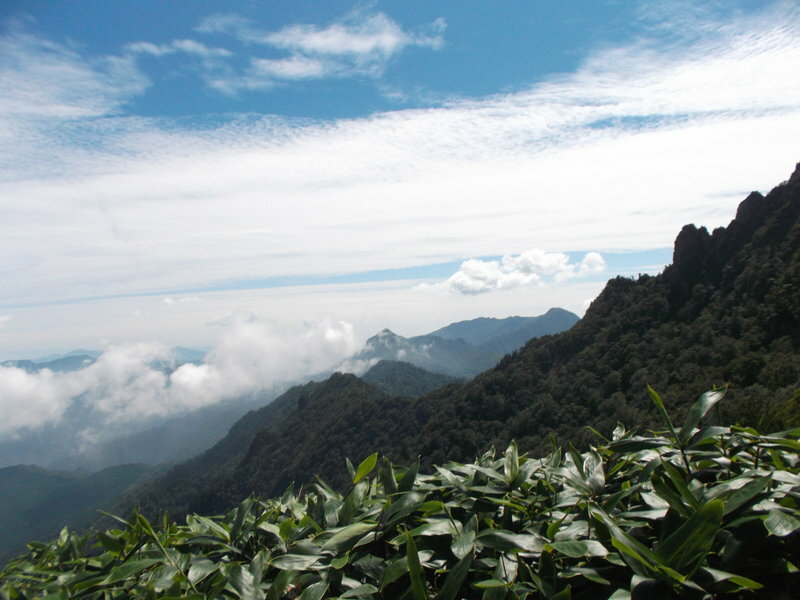 Most mountain porters are indigenous people, and they earn decent pay for people living in Taiwanese mountains. I once met a 19-year-old porter who already had a wife, and a baby, and was saving money to buy a house, which he expected to be able to buy in a couple years. Very few 19-year-olds in the USA expect to be able to buy a house in a couple years. This, of course, is tied to the stereotyping of indigenous people in Taiwanese culture. Taiwanese people tell me that indigenous people are particularly strong and suited for heavy work, unlike the Han Taiwanese (the vast majority of the population). 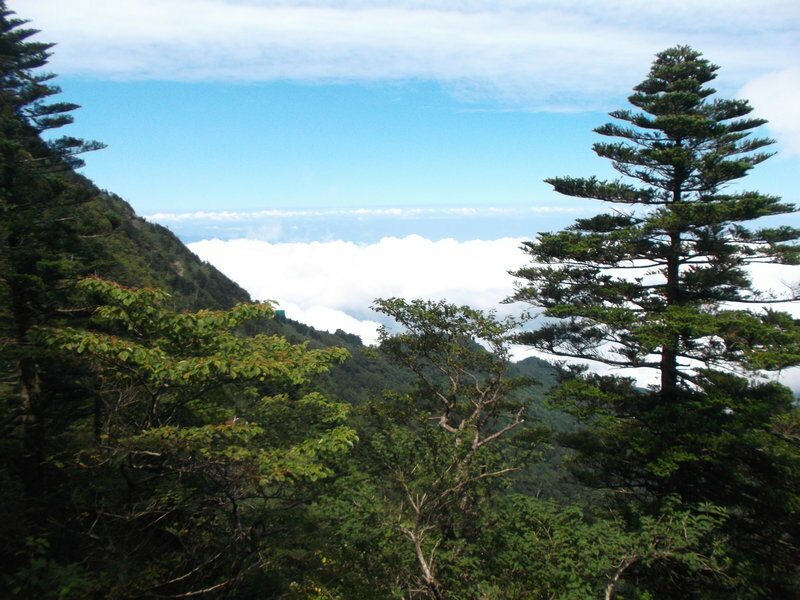 Many Taiwanese people consider indigenous people to be unfit for any kind of work other than manual labor or singing and dancing – this makes it difficult for indigenous people to get white-collar jobs in Taiwan. 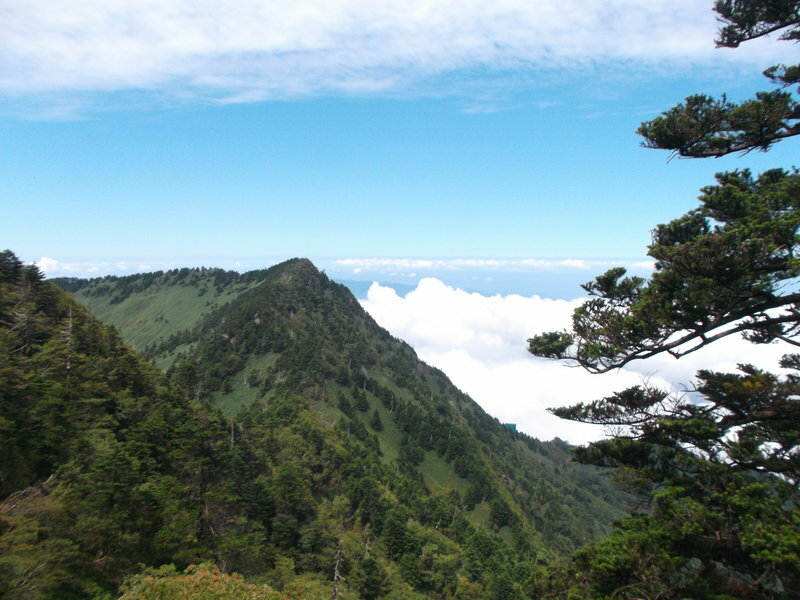 Taiwan, at least, has a group of people who are willing to work as porters. Japan doesn’t have that among its native population, and Japan is very reluctant to accept immigrants (even though the Japanese government seems to be laxer about enforcing immigration rules in the mountains than in the cities). Thus, even though helicopters require a ton of fuel, and gasoline is significantly more expensive in Japan than in Taiwan … well, the Japanese can’t hire porters they don’t have, so they use the helicopters they do have. 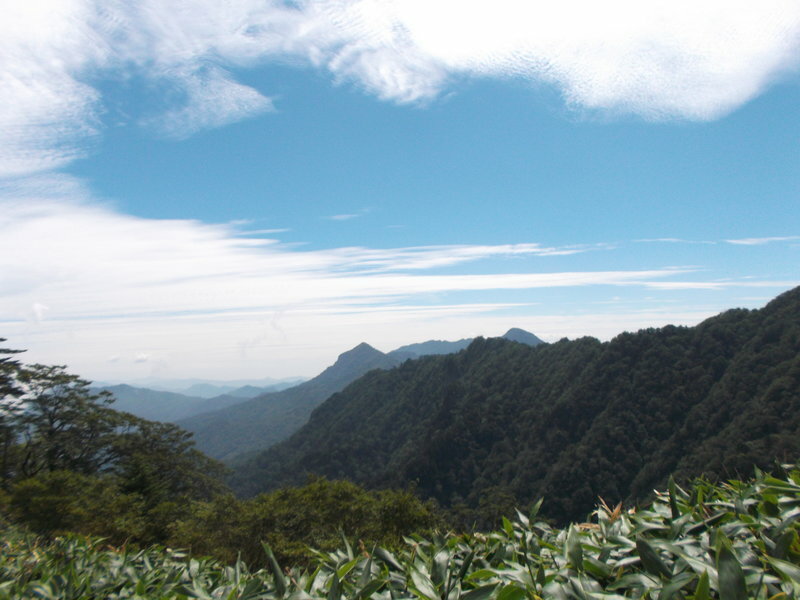 There are three sets of chains up to the peak. Pilgrims are supposed to use the chains to go up. If I really wanted to, I could have gone up the chains as well. However, I did not come to Ishizuchi-san for religious reasons, and I don’t like going up chains, so I went up the stairs instead. 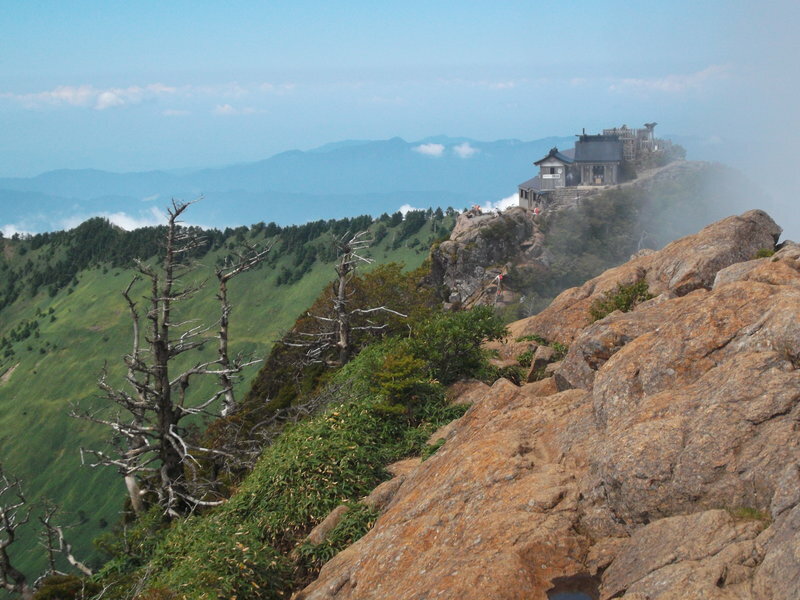 I will describe the roof of Shikoku – and the most beautiful sight I saw in all of western Japan – in the next post.